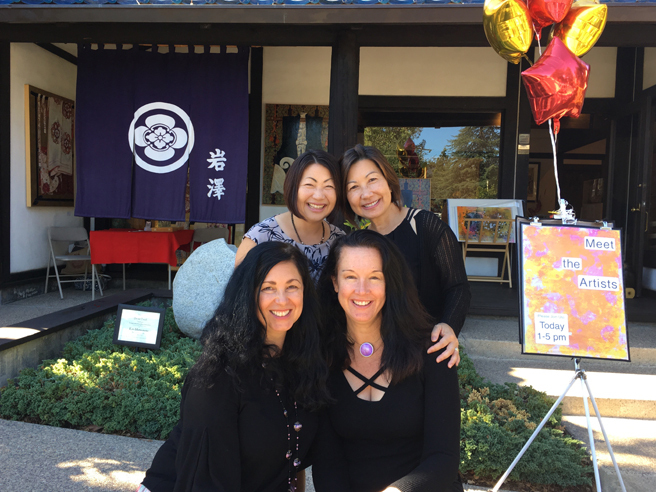 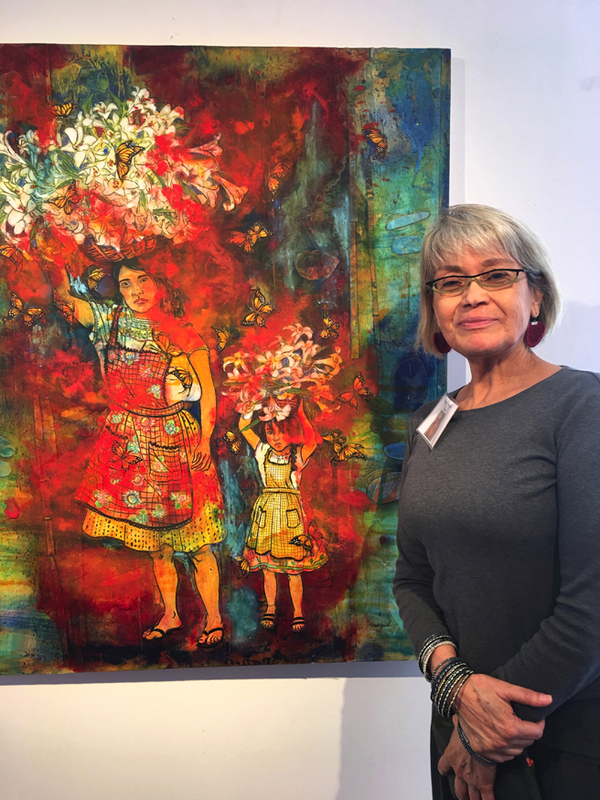 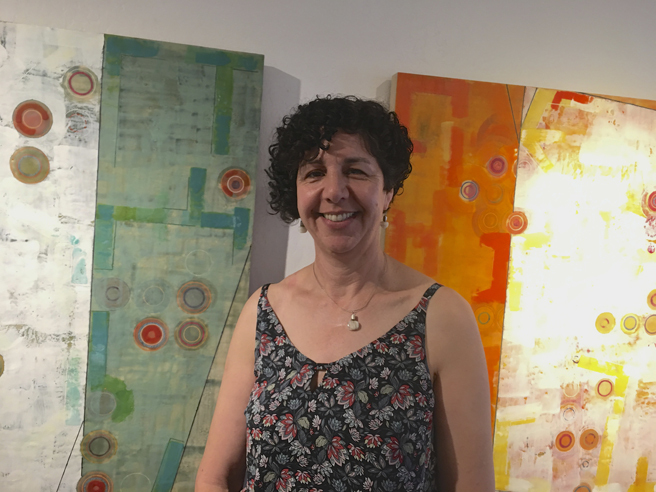 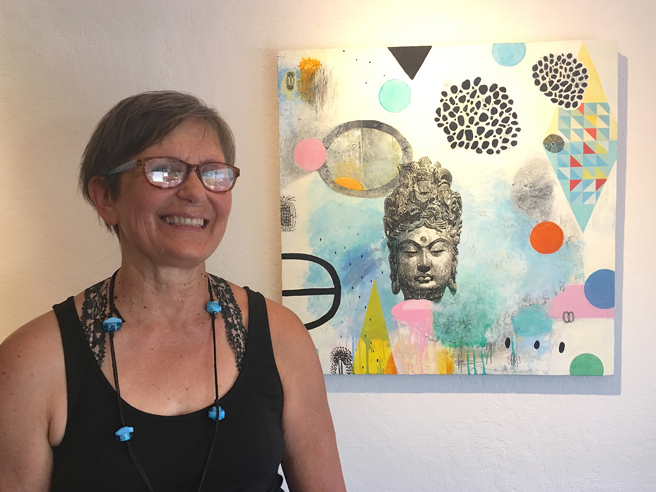 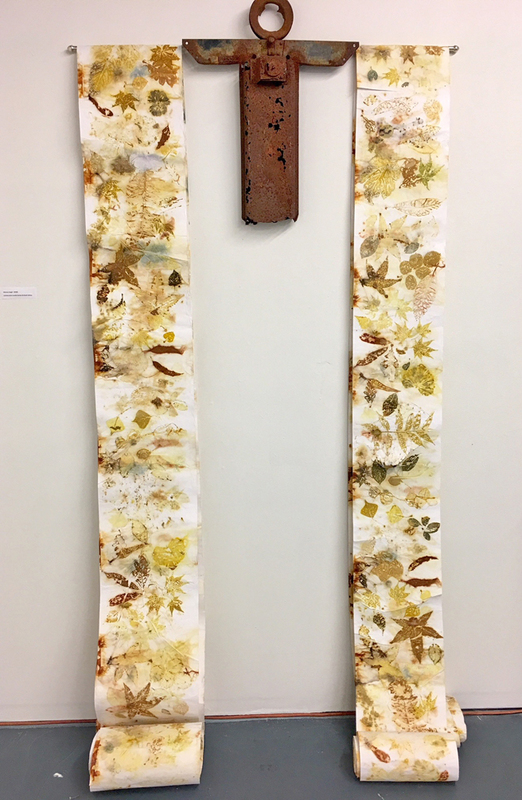 Bay Area artists Dotti Cichon and Jamila Rufaro have a joint exhibition, Earth Wind & Fire at Kaleid this month in downtown San Jose, California. 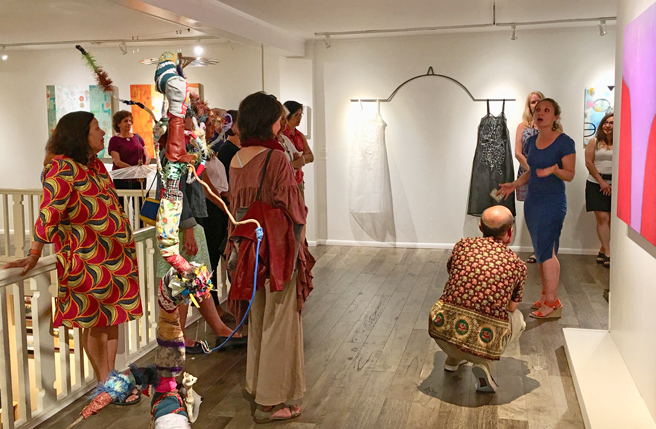 The show focuses on the use of natural and weathered materials, rworn and rusted materials, silk papers and metalics. 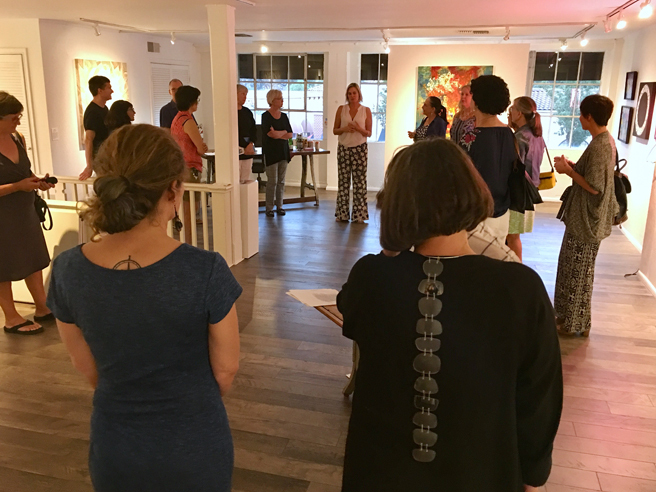 I was so happy to attend the Aritsts’ Reception which coincided with Kaleid’s fabulous Two-Buck Tuesdays! 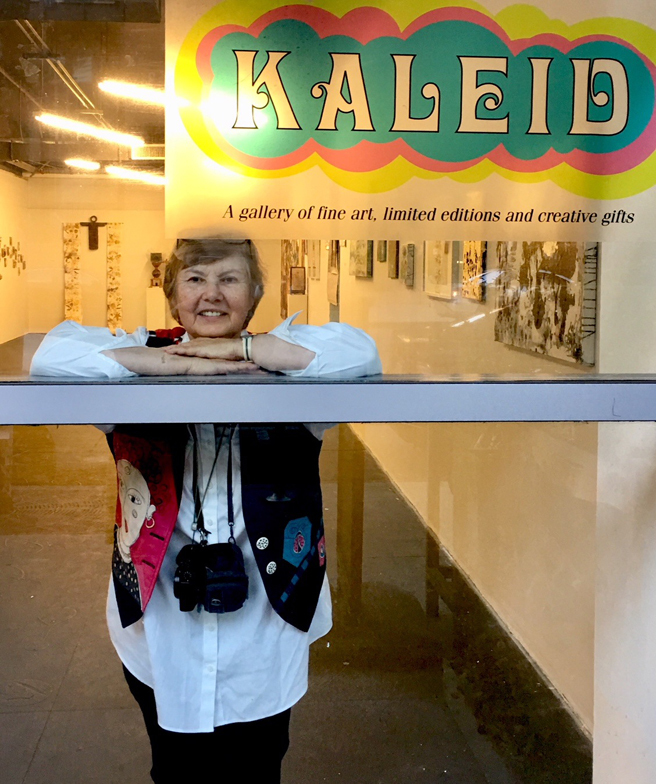 Artist Dotti Cichon at Kaleid, 88 S 4th Street, San Jose, California. 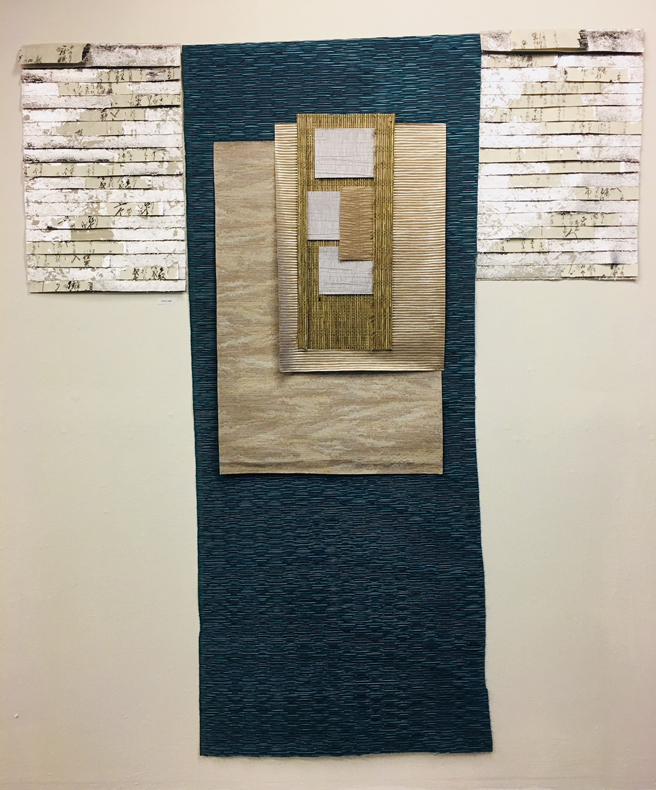 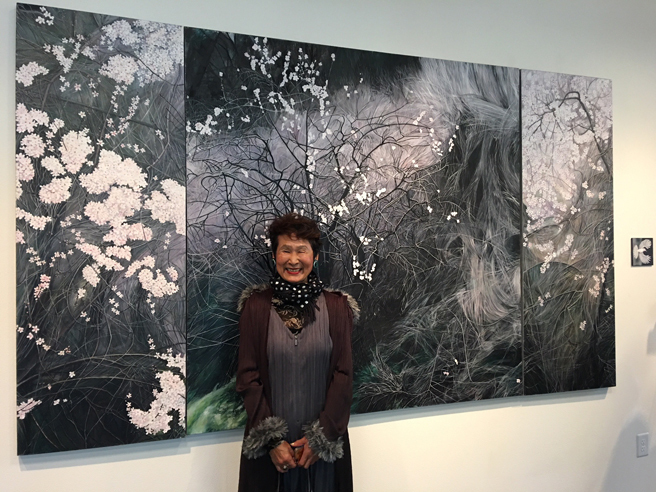 Dotti Cichon’s silk panels have beautiful abstracted patterns printed from her manipulated digital photographs of global architecture. 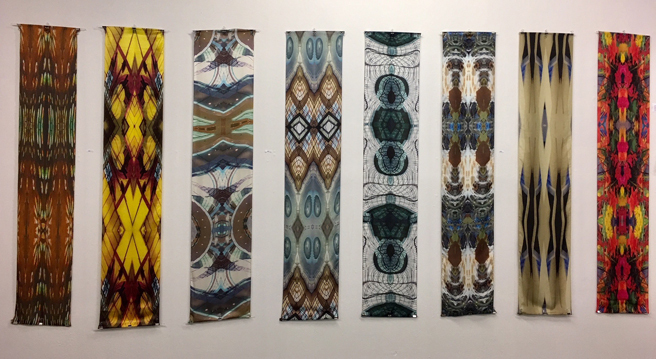 They can be worn as scarves as well (I’m a proud owner of one not depicted here). 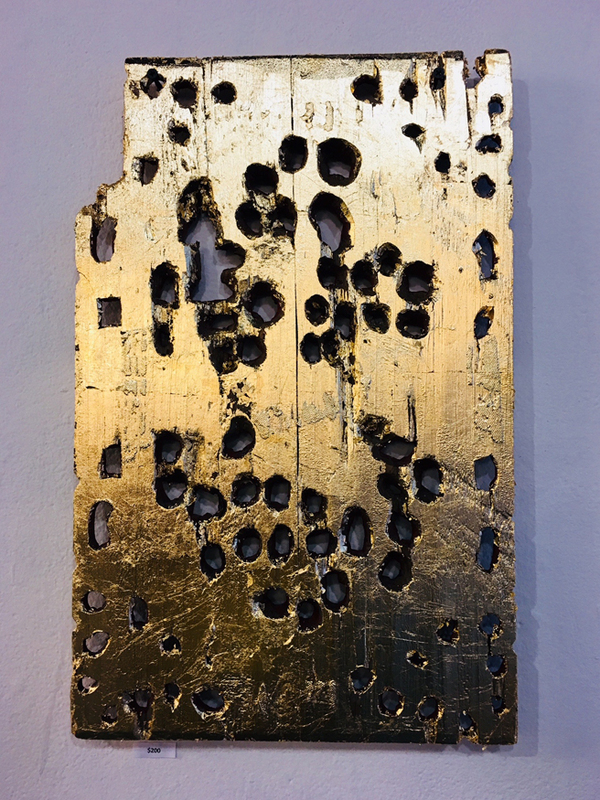 In this gold leafed panel Dotti Cichon strikes an elegant balance between the organic, “worm-holed” treatment and the sumptuous gold finish. 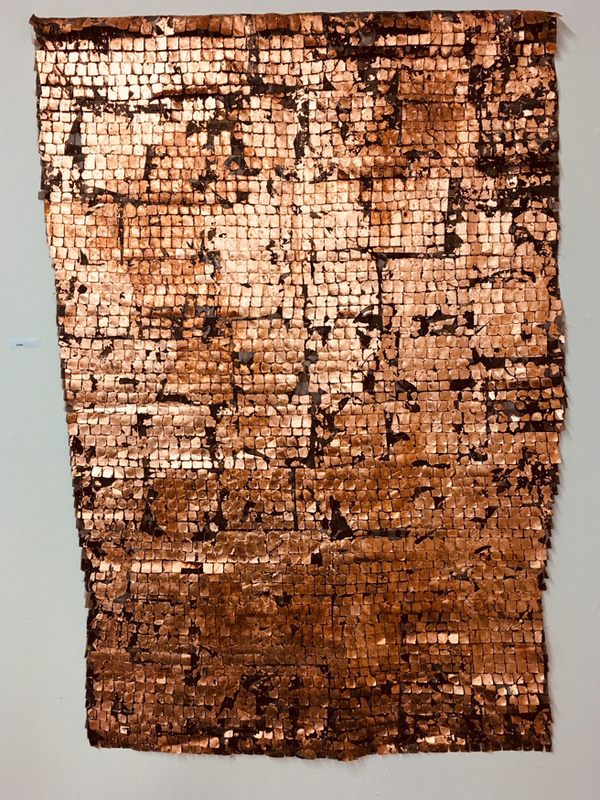 This copper-leafed textile is another beautiful metallic treatment of an organic feeling surface. 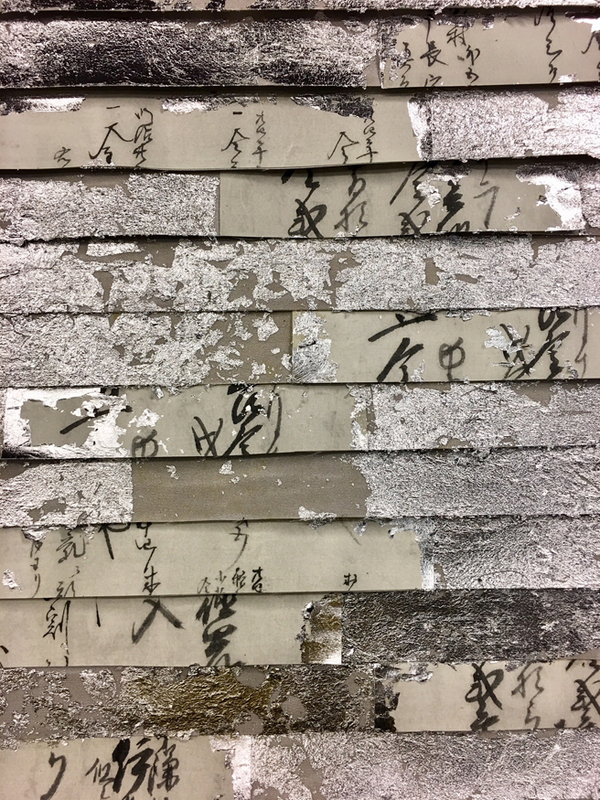 Here is a detail of silver leafed papers, some with remnants of calligraphy from the silver kimono assemblage below. 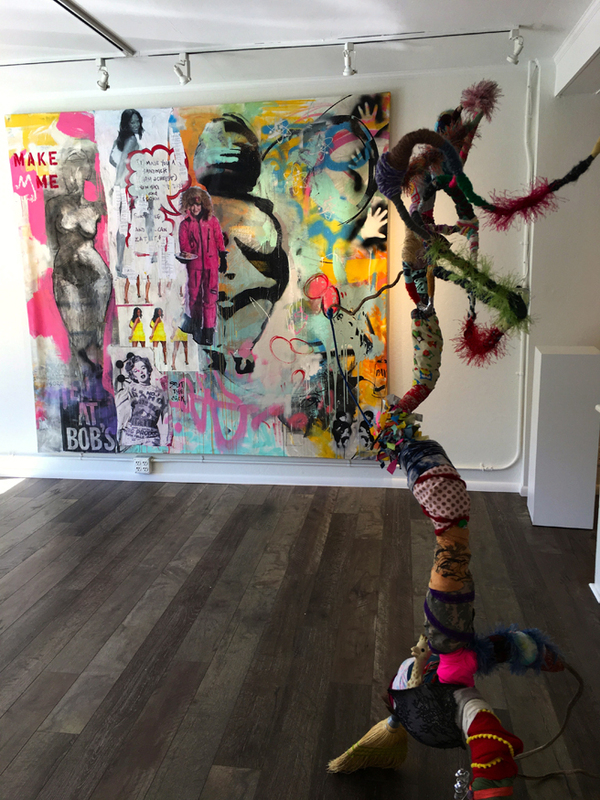 Kimono Angel assemblage by Jamila Rufaro and Dotti Cichon. 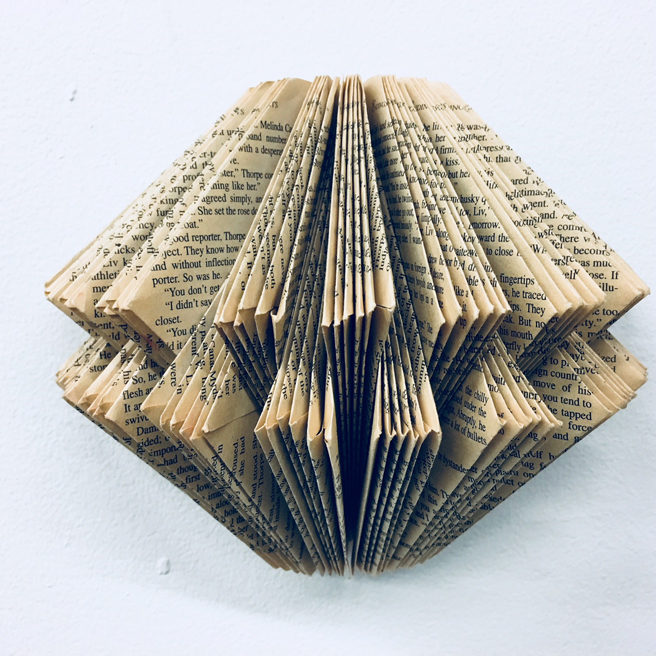 Book art by Jamila Rufaro is inspired by imaginary sea life and Cortez. 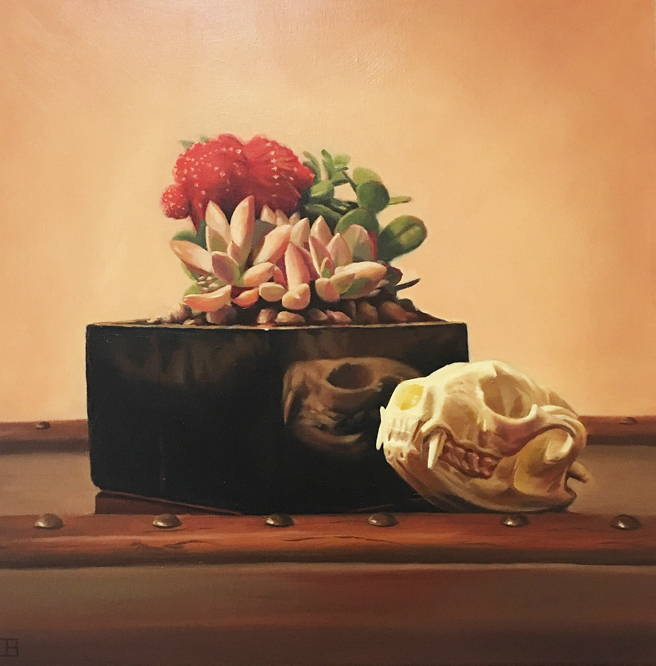 I have one of here pieces from this series that was exhibited at Sanchez 50/50 2017! 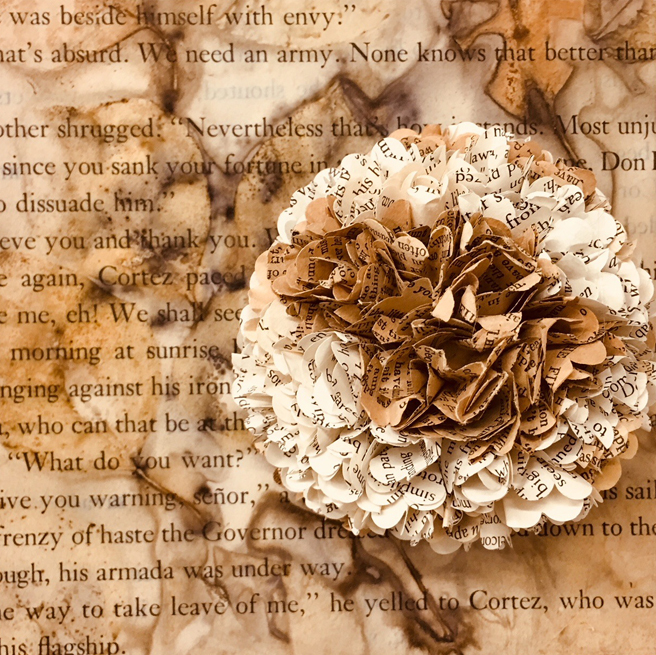 I love the forms that Jamila Rufaro has created manipulating book pages! 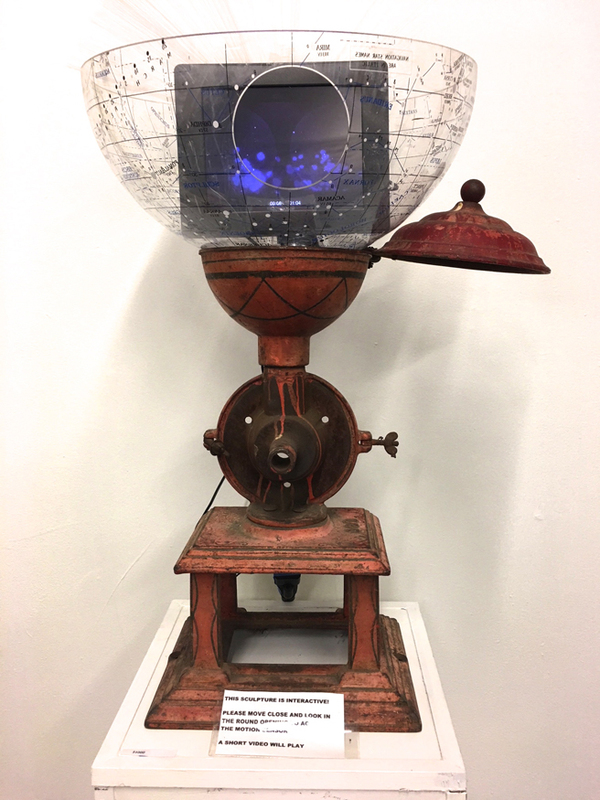 Such a Fascinating interactive sculpture with video depicting the origins of the cosmos by Dotti Cichon. 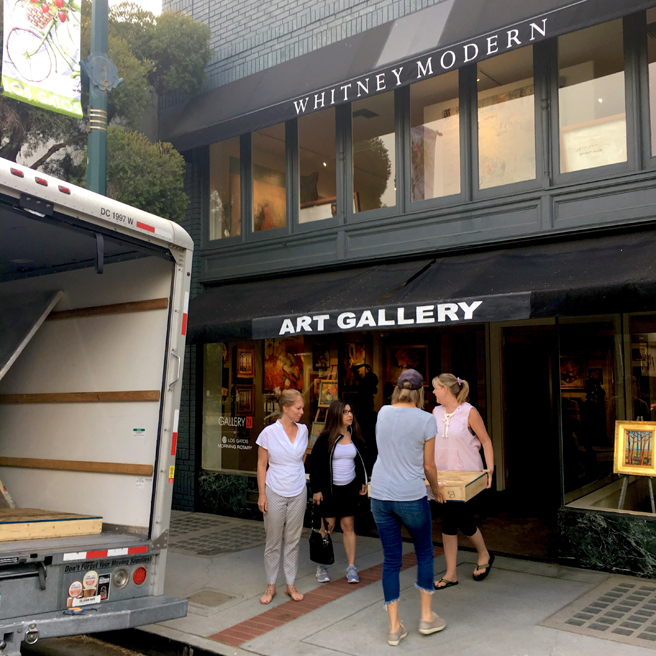 Spent the day with Suzanne Whitney-Smedt, Karen Gutfreund, Marianne McGrath and Rozanne Hermelyn Di Silvestro, because it’s more fun to unload a U-Haul together! 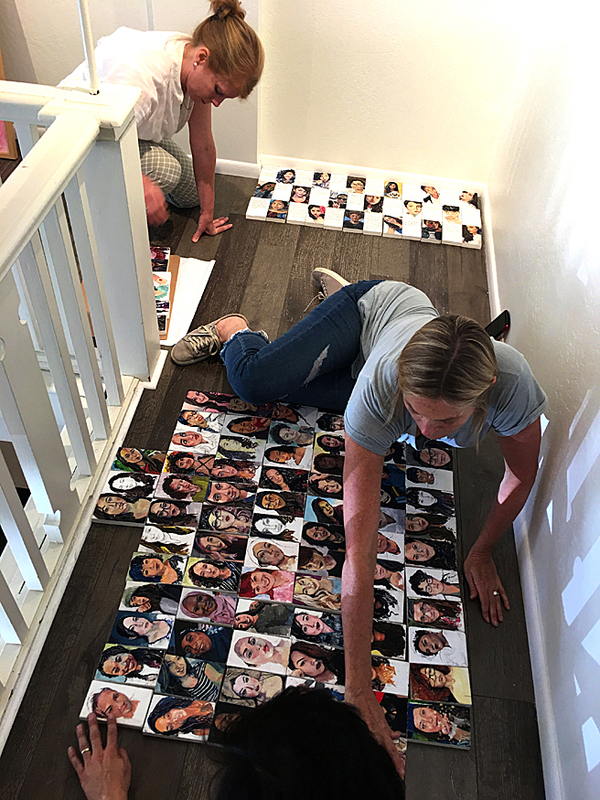 Many hands make for light work! 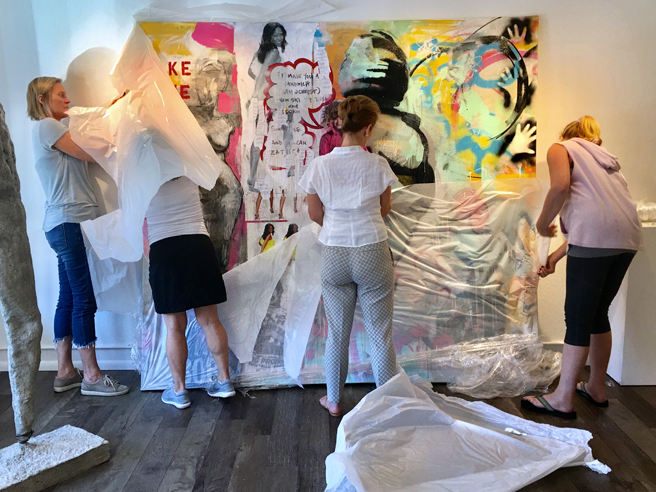 Unwrapping Jenny Reinhardt‘s huge painting Split the Sack. 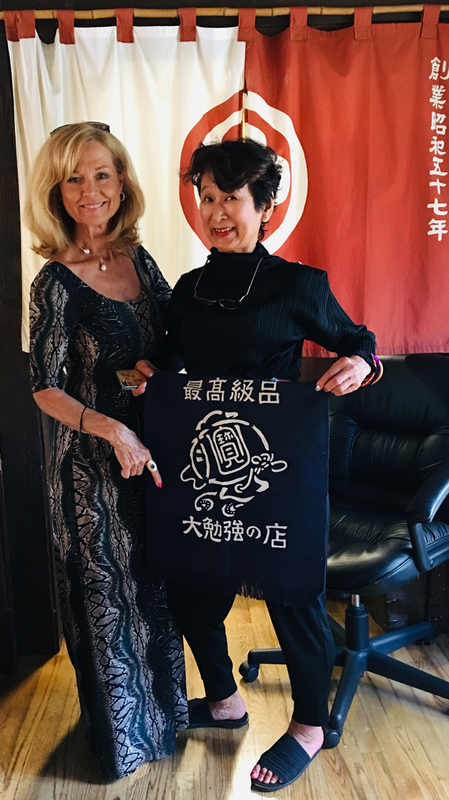 Looking good together! 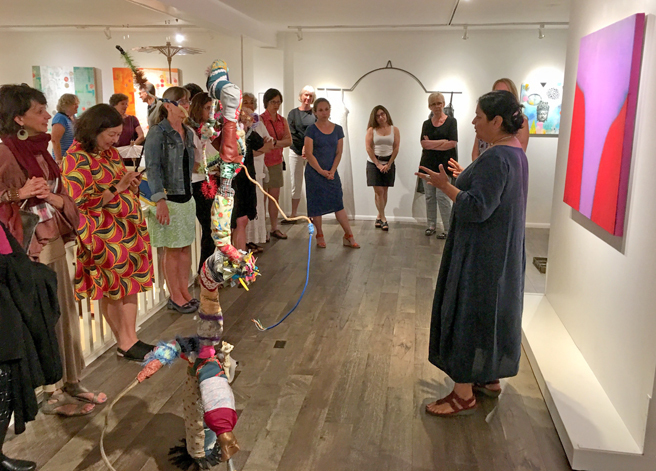 Jenny Reinhardt‘s Split the Sack and Gina Herrera‘s sculpture, Jaunting for Restitution. 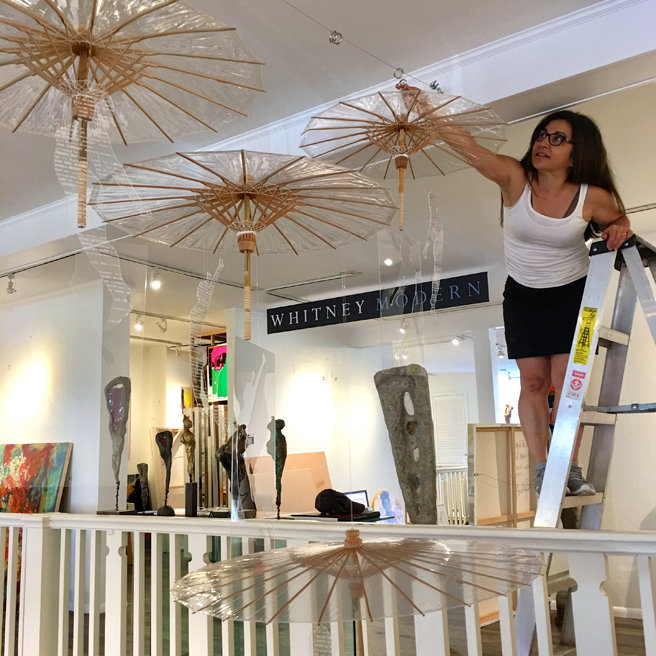 Rozanne Hermelyn Di Silvestro installing her installation, In a Constant State of Rising and Falling. 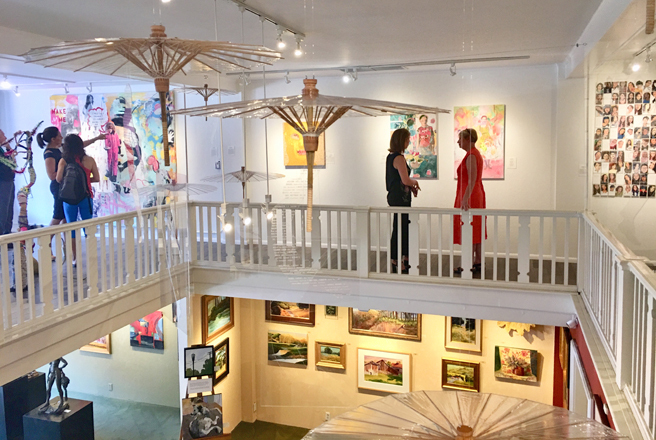 The installation can seen from Gallery 24 down below as well. 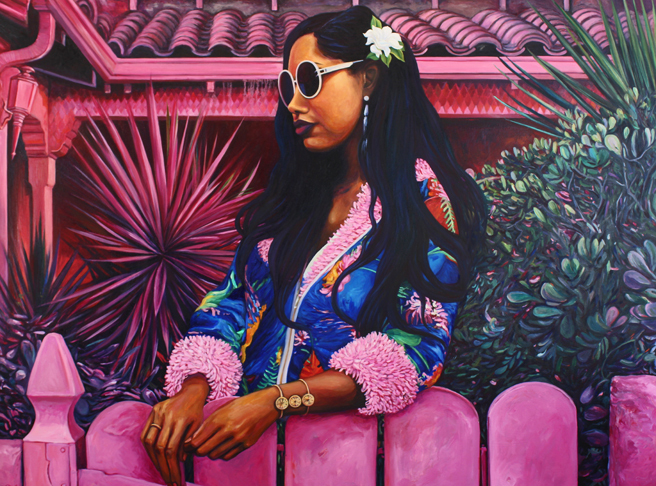 Laying out the pieces of the puzzle, Nayda Cuevas paintings #latina:Reclaimingthelatinatag. 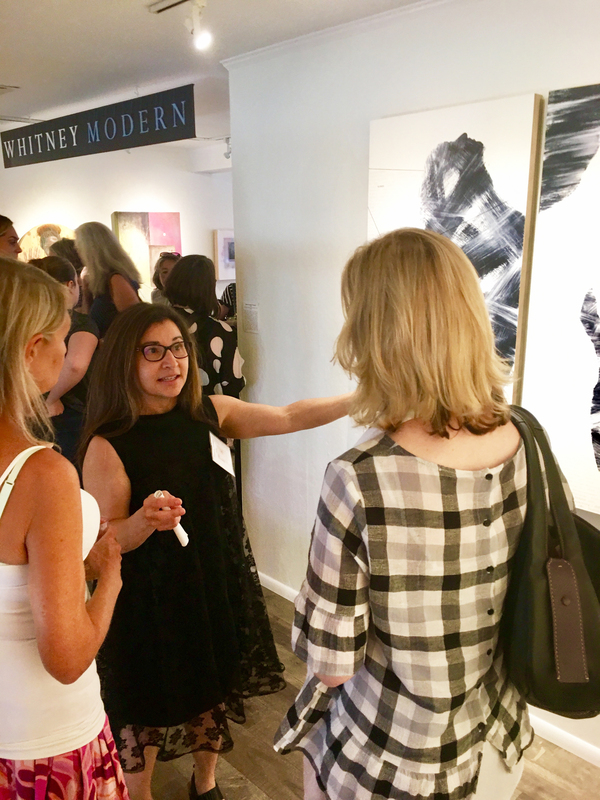 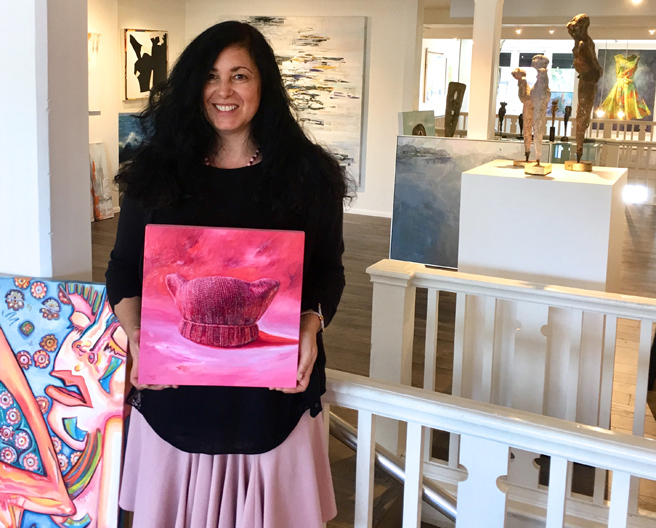 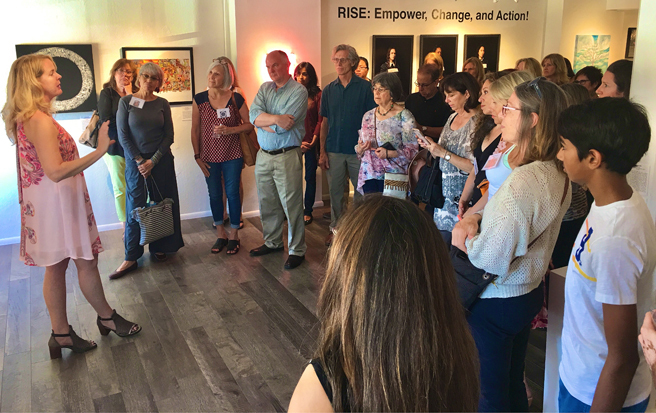 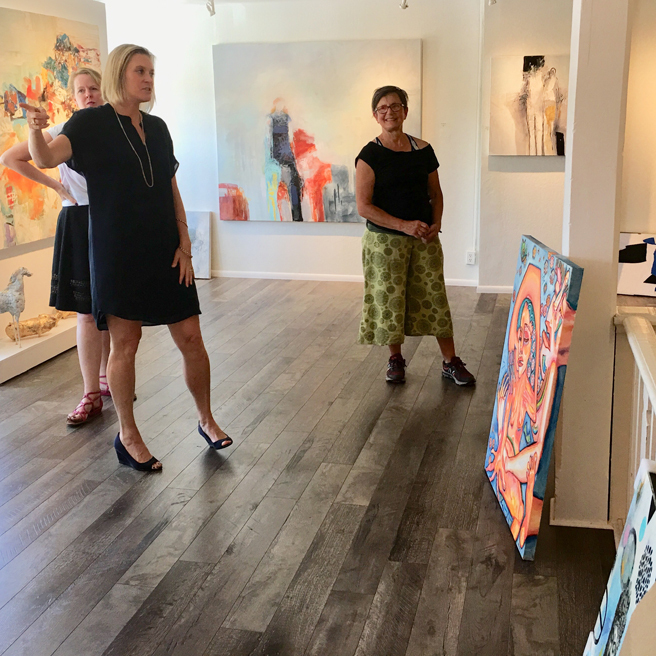 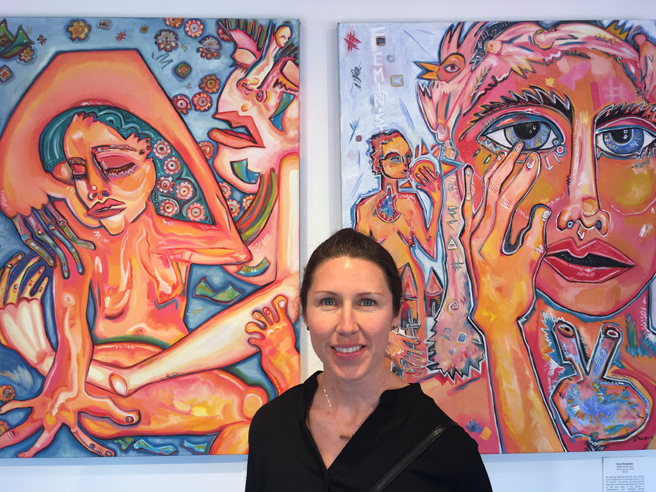 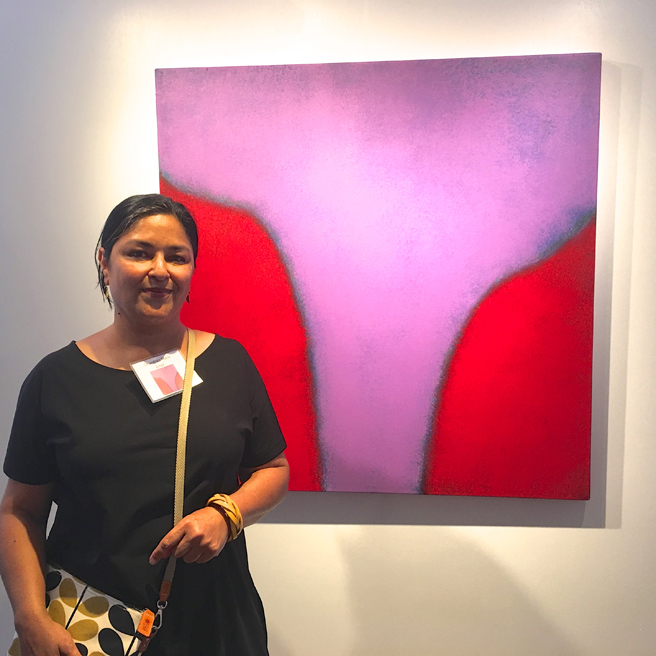 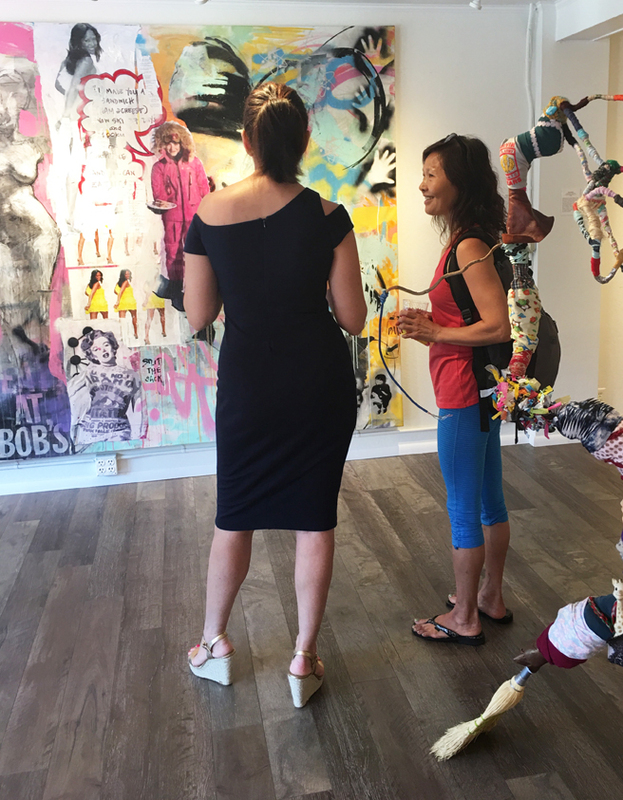 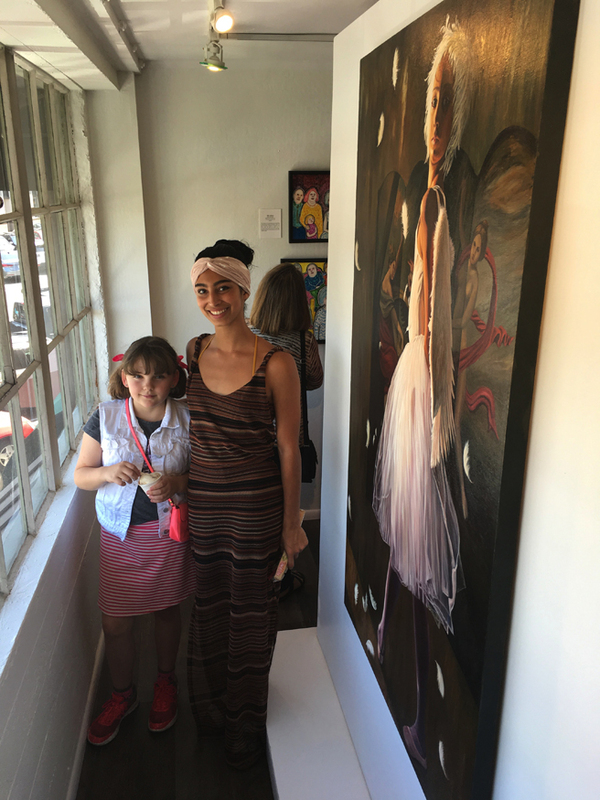 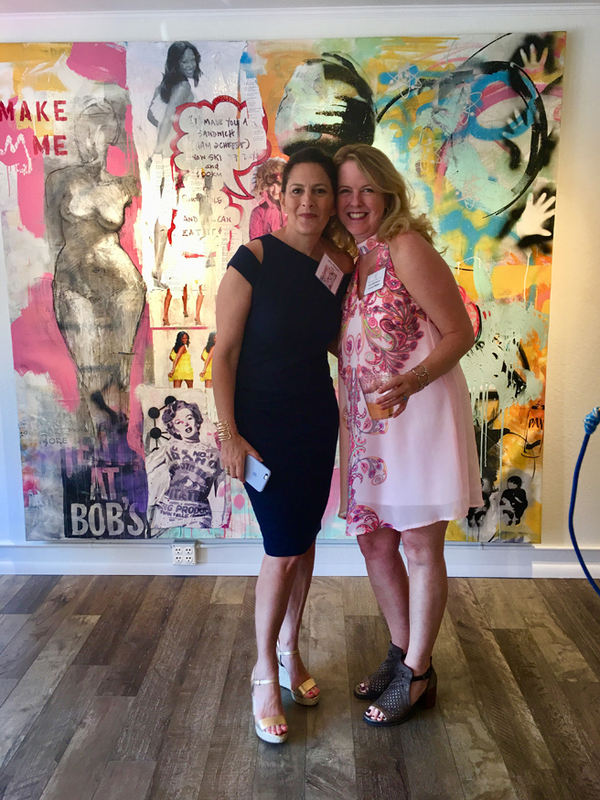 I brought in my painting, In the Pink, to Whitney Modern on Friday, for the upcoming Gutfreund Cornett Art show RISE: Empower, Change and Action! 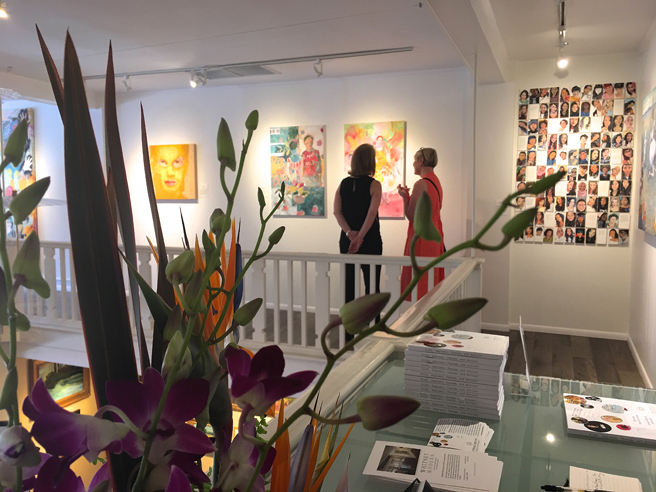 and was delighted to find the exhibition catalogues hot of the press! 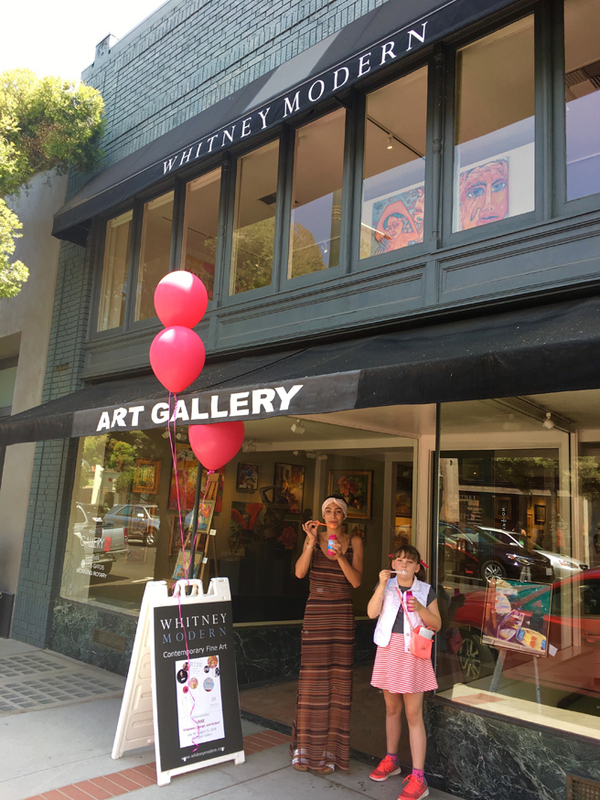 It tells us about Gutfreund Cornett Art with its vision of “Changing the World Through Art” and Whitney Modern a much needed Contemporary Fine Art Gallery in the heart of the Silicon Valley, the curators of the show, Gutfreund Cornett Art, Marianne McGrath and Suzanne Whitney-Smedt, the guest jurors: Jessica Porter, Kelsey McDonnel and Joan McLoughlin (and all the special award winners) and documents all of the art in the show with artists comments about their pieces. 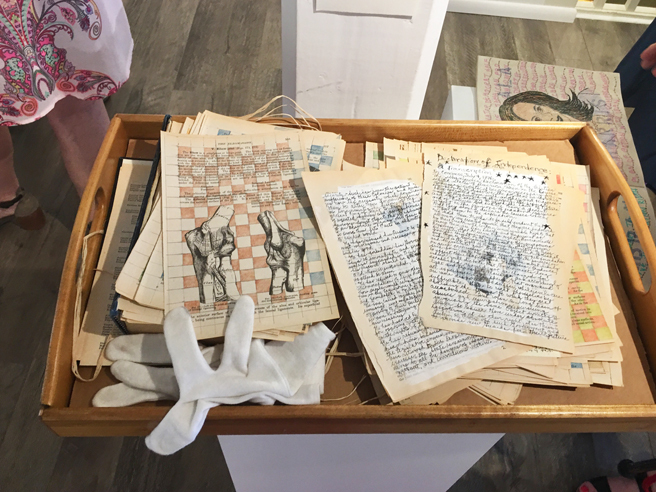 There are also two important essays on the importance of social activist art and engaging with community by Sherri Cornett and Karen Gutfreund. 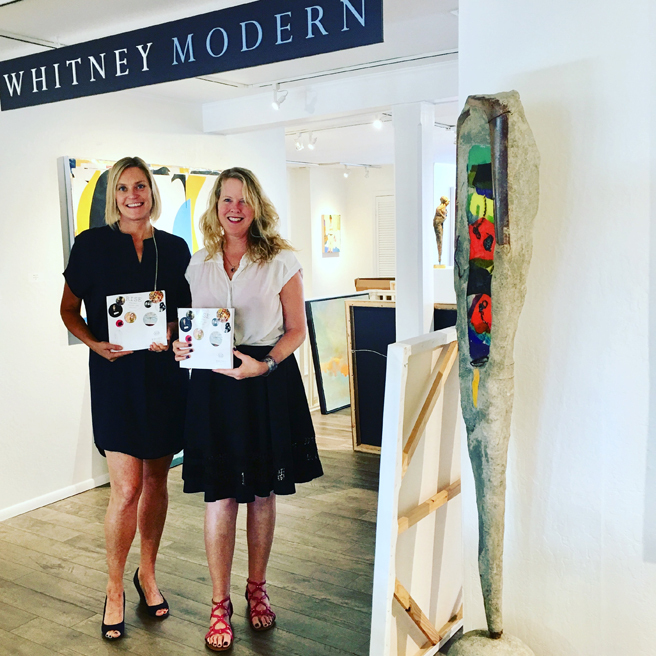 Gallerist, Suzanne Whitney-Smedt and Curator / Artist, Karen Gutfreund, (curators for the exhibition along with Sherri Cornett and Marianne McGrath), graciously modeling the new catalogue for me. 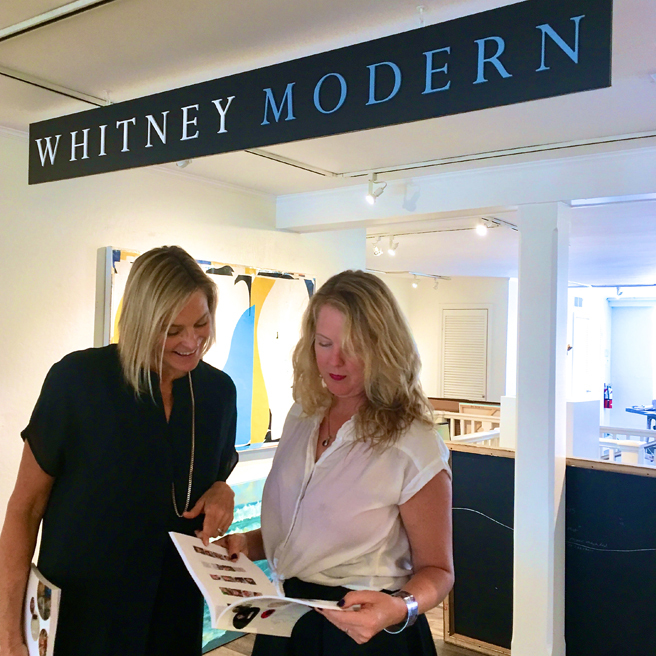 Catalogues are available at Whitney Modern while supplies last or through Amazon. 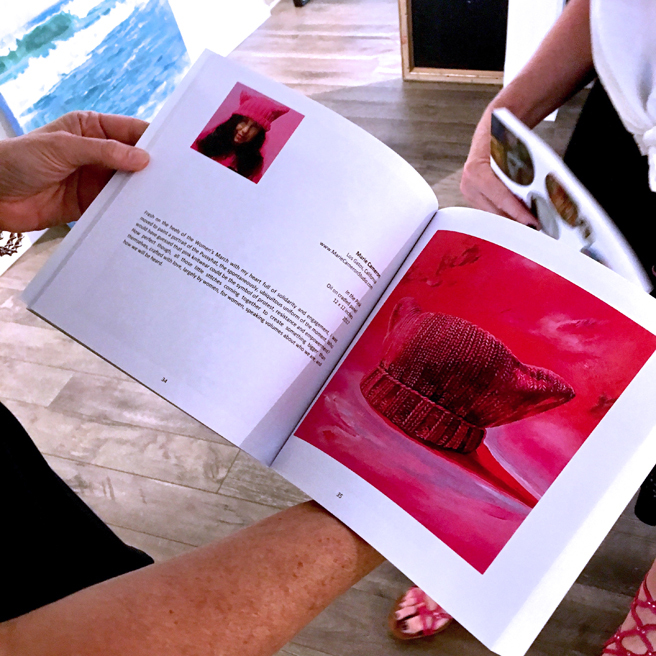 165 pages of gorgeous images and inspiring content! 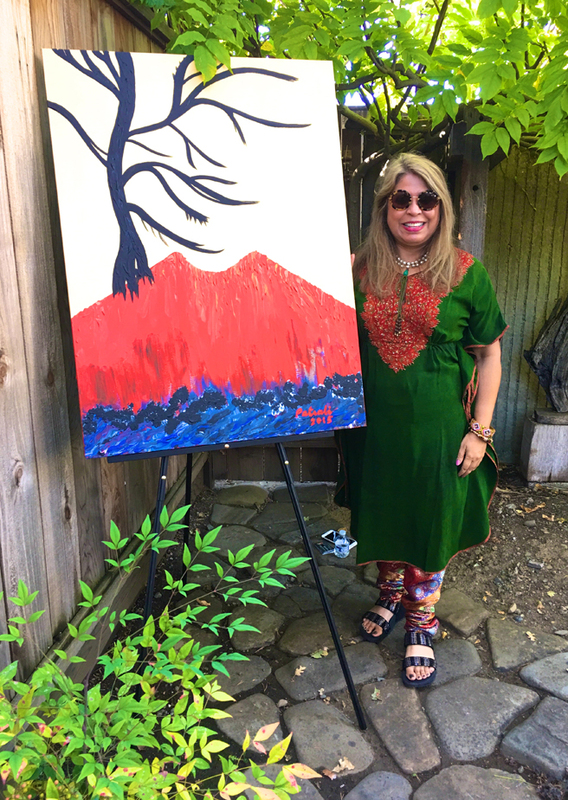 Santa Cruz artist, Karuna Gutowski was bringing in her Ambient Thoughts painting just as I was leaving. 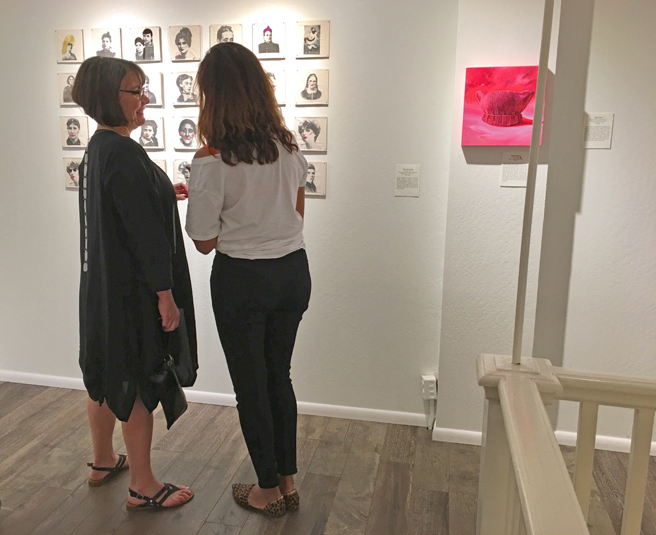 It’s in the bottom right corner, just below Scotts Valley artist, Dana Richardson‘s painting Burning Woman. 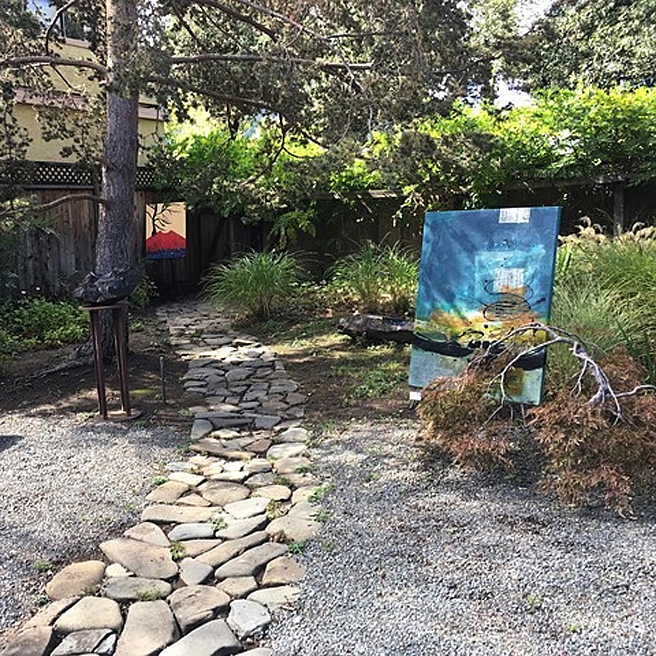 Can’t wait to see the rest! 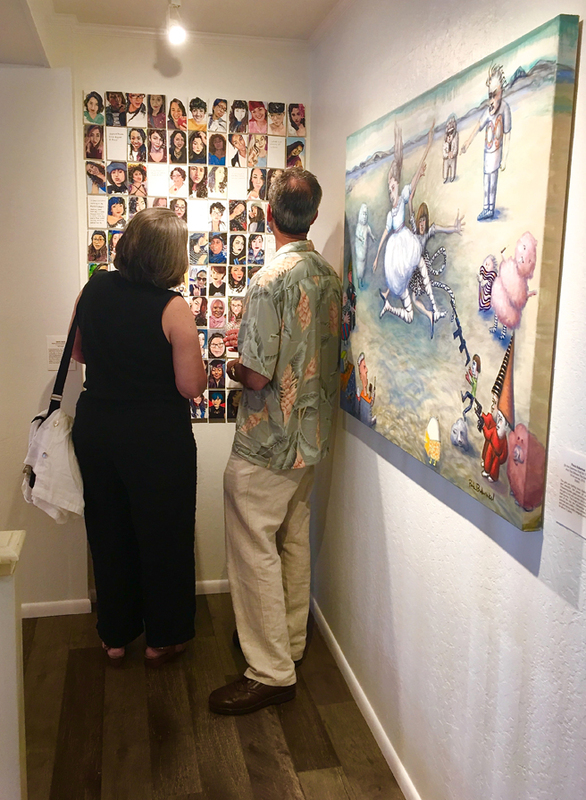 The exhibition runs July 18 – August 31 with an opening reception and artist talk Saturday July 21 12:30 – 3:30pm. 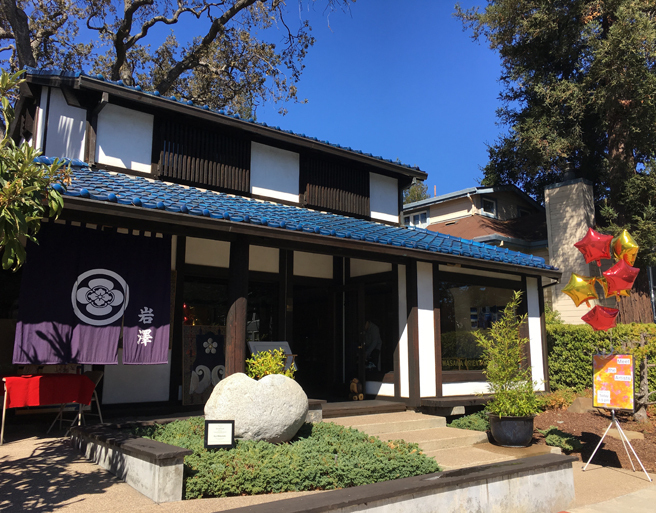 24N Santa Cruz Ave, Los Gatos, California. 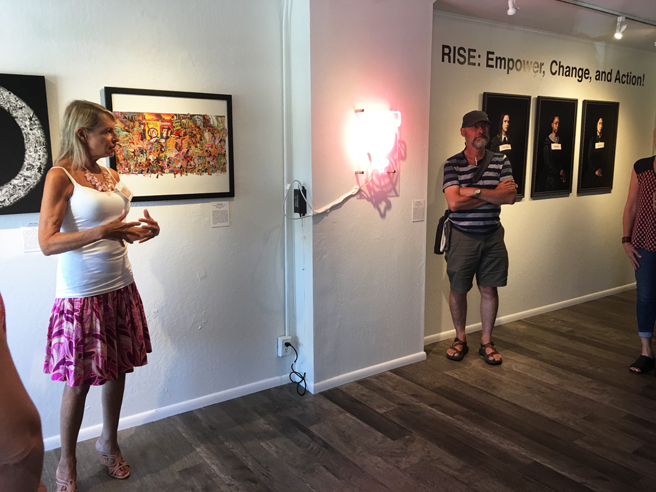 I have some very exciting news to share, both of my paintings, In the Pink and Feathers have been selected for Rise, a nationally juried show organized by Gutfreund Cornett Art in conjunction with Whitney Modern that will run July 18 – August 31, 2018 in Los Gatos California. 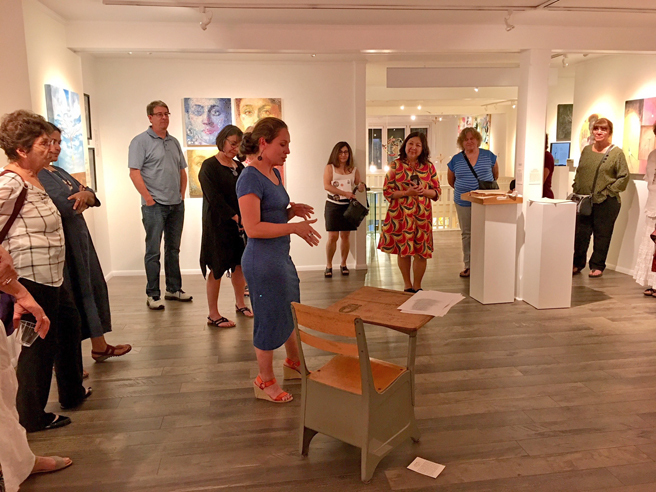 For a preview of the inspiring and powerful work included in this exhibition, curated by Suzanne Whitney-Smedt, Marianne McGrath and Gutfreund Cornett Art, visit GutfreundCornettArt.com where you can also see who won the Special Recognition Awards, selected by Jessica Porter, David Weinberg and Joan McLoughlin! 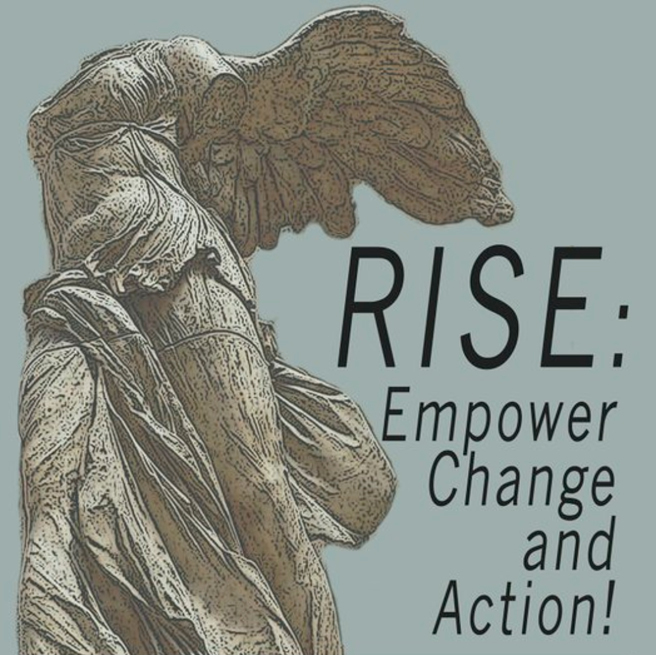 “RISE: Empower, Change and Action! 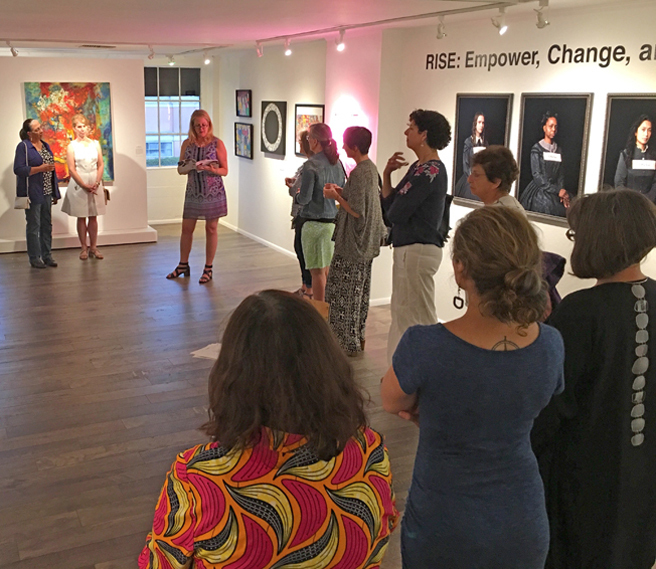 seeks to bring artists into dialogue and to bring forth what is important to self, community, our nation and the world at large through art that reflects and addresses complex socio-cultural issues and focuses on a vision for a more positive, empowering future, particularly for self-identified women and girls as well as their families. 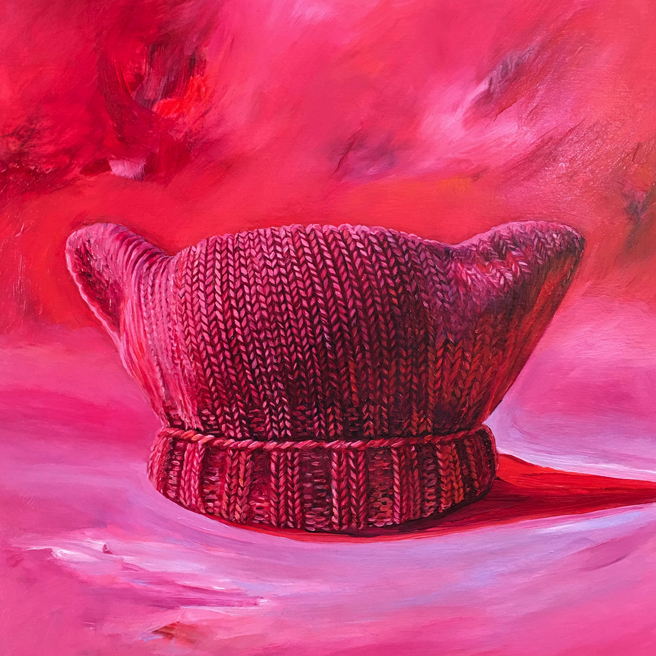 It is underpinned by the feminist principle that believes in political, economic and social equality for all.” – from the show’s prospectus. 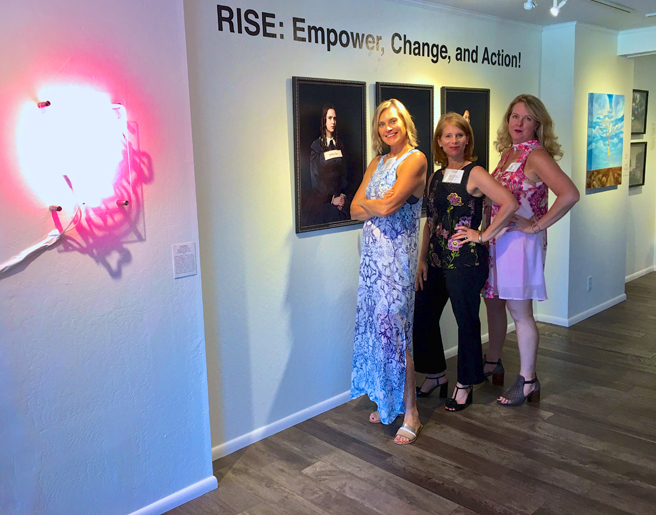 Such an honor to be exhibiting with this great array of artists working for empowerment, equality and social justice! 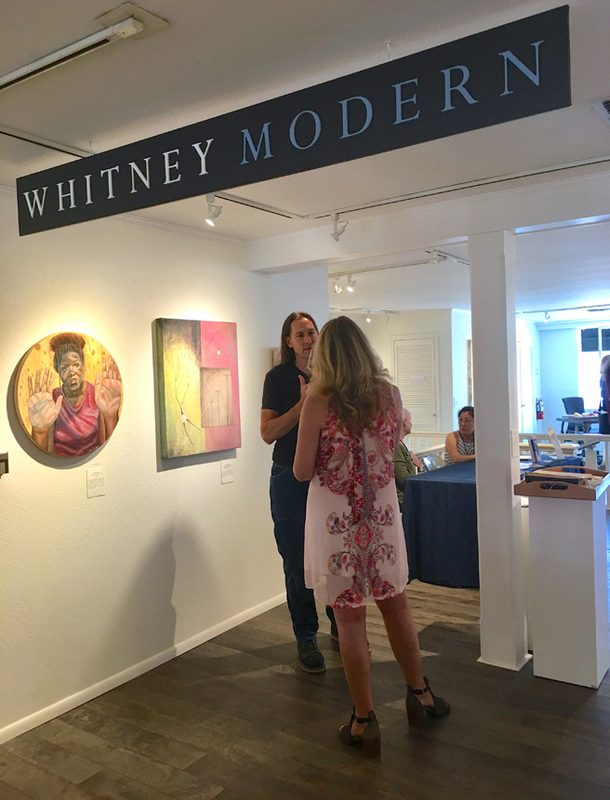 Mark you calendar, the reception will be held at the Whitney Modern, 24 N Santa Cruz Ave (on the second floor) Saturday, July 21, I’ll post the exact time closer to the date. 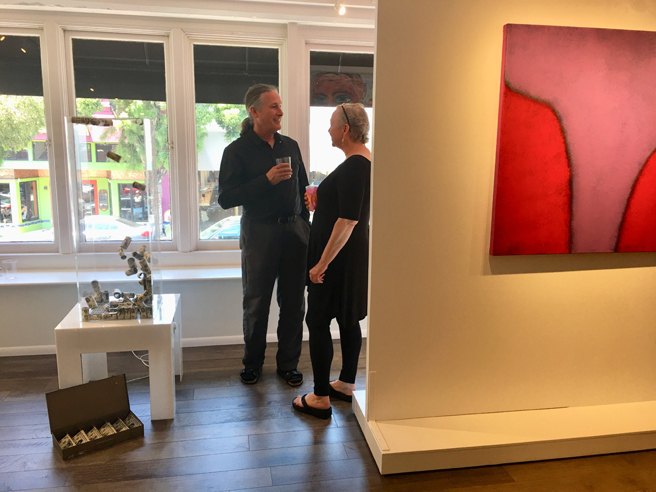 Recently I had the pleasure of meeting with David Flick in Los Gatos, California. 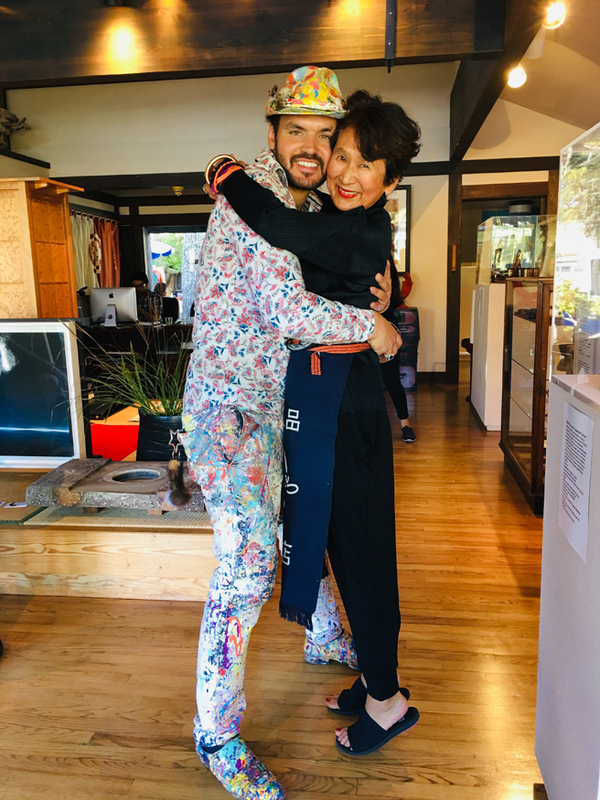 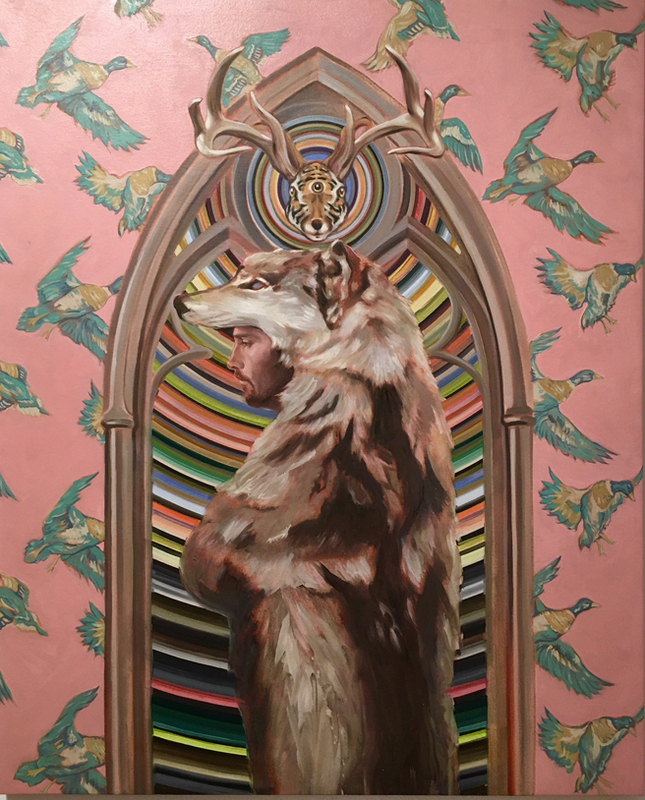 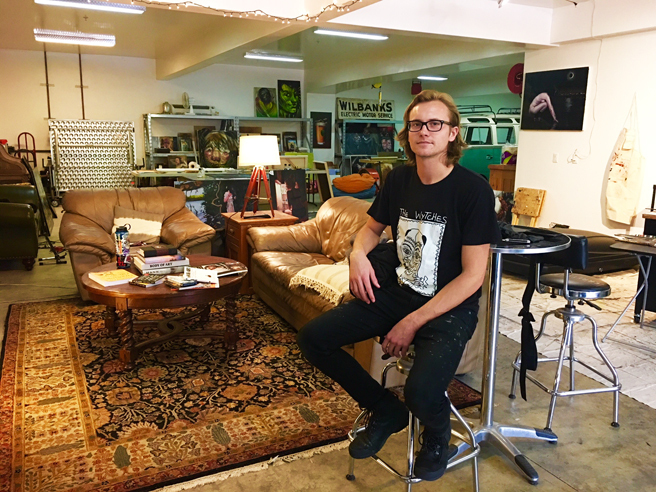 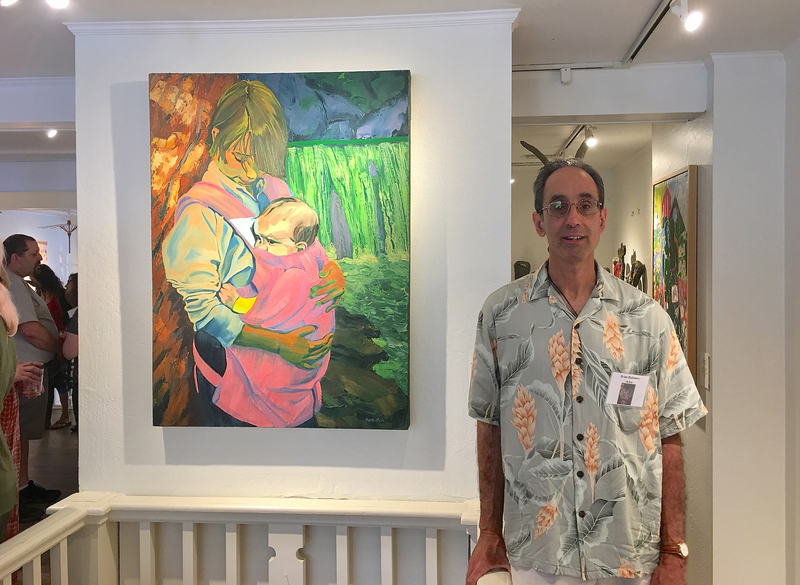 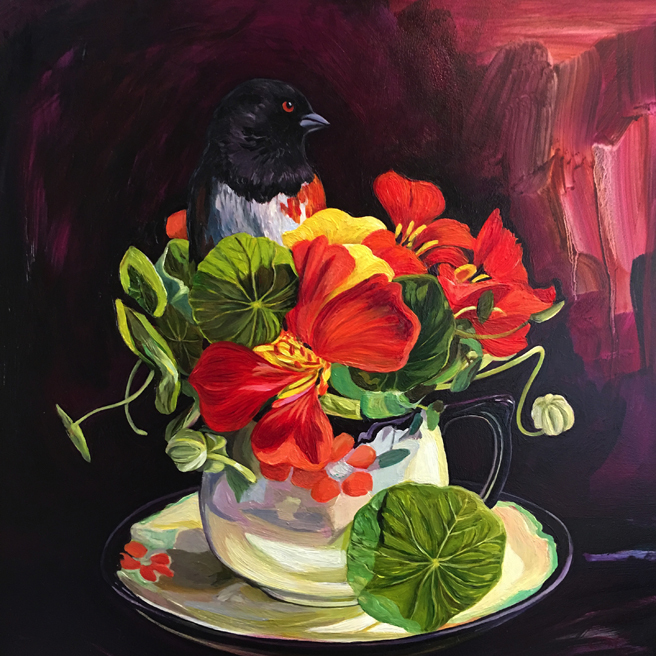 I had seen his work previously in a pop-up downtown and was very impressed with his portraits and figurative work and so when he turned up at my studio during NUMU’s Historic Home Tour this year I asked if I could visit his studio. 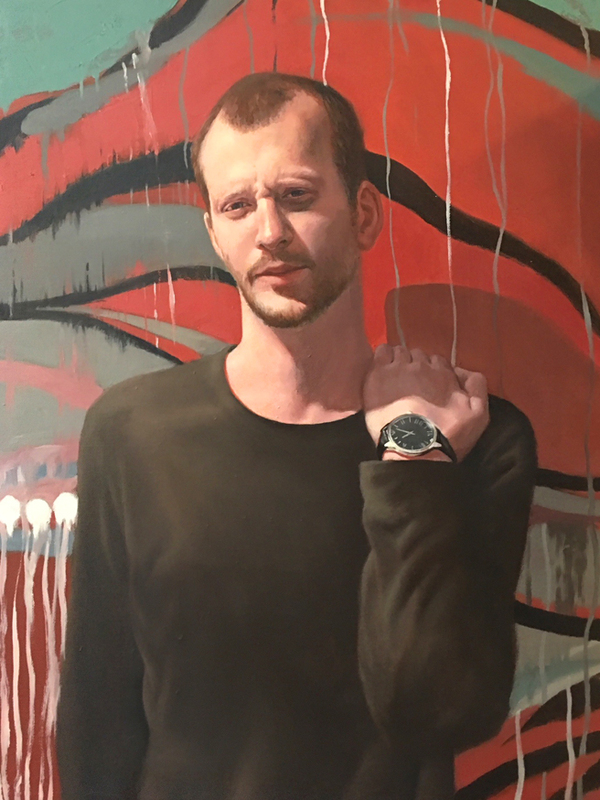 I’m so glad I got a chance to see his work before he goes off in the fall to begin his MFA at the New York Academy of Art! 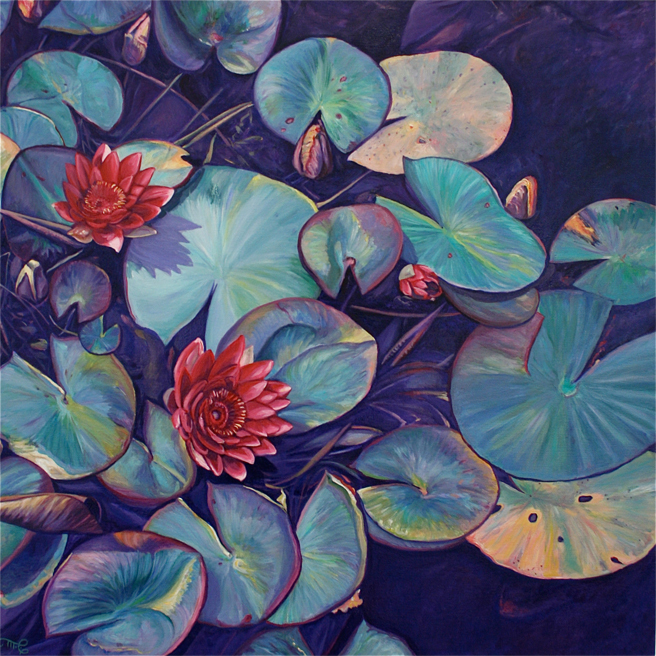 I was immediately drawn to Flick’s sensitive rendering of the figure and his gorgeous handling of light (oblique shadows, spotlighting, backlighting and reflections) and his innate sense of color. 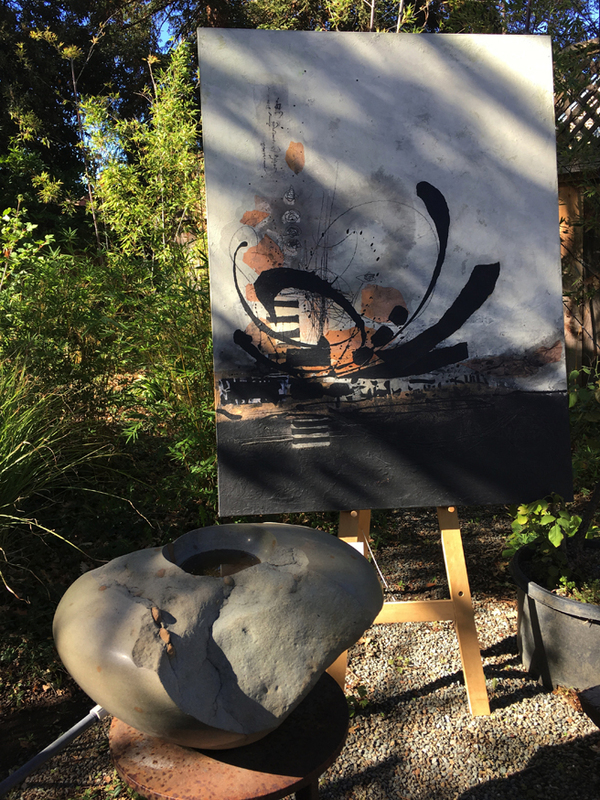 His compositions too are thoroughly dynamic. 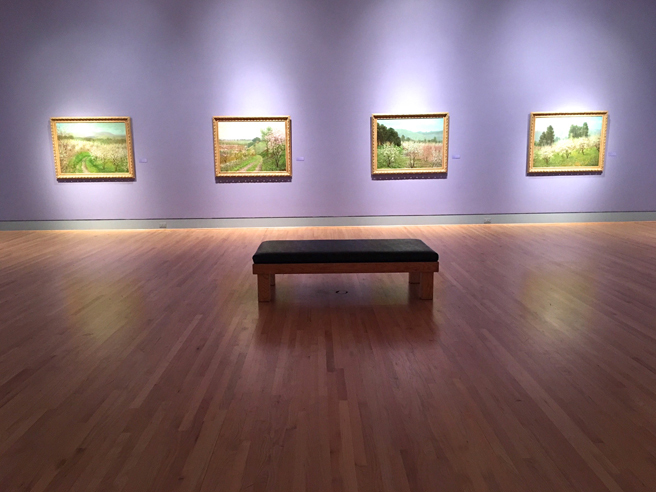 But beyond these great technical aspects, his subjects are all really compelling, with a captivating point of view that draws one deeper in to the work. 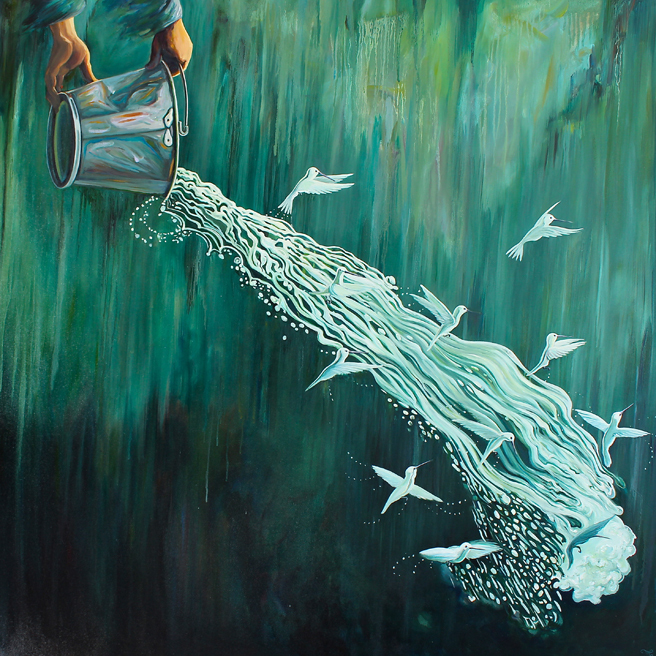 He’s not afraid of paint either and can make it behave or explore it’s wilder side. 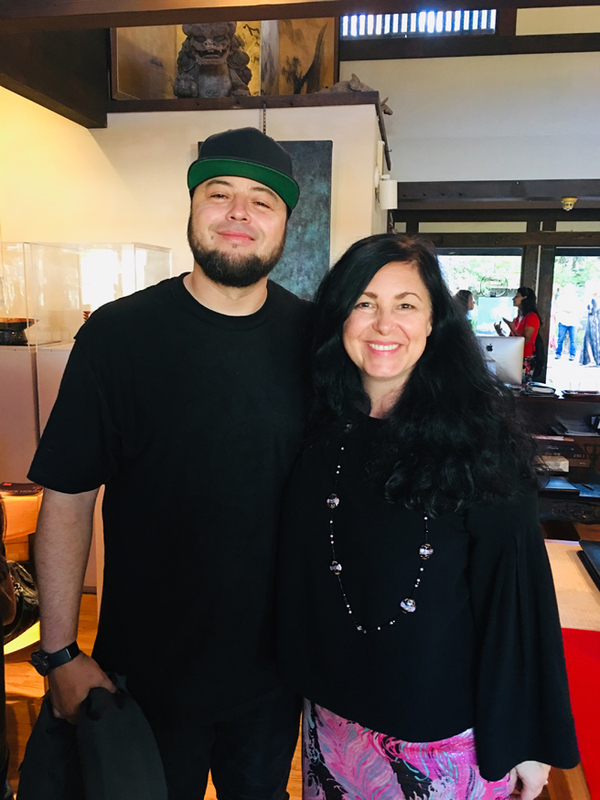 I can’t wait to see where his MFA journey will take his work…. 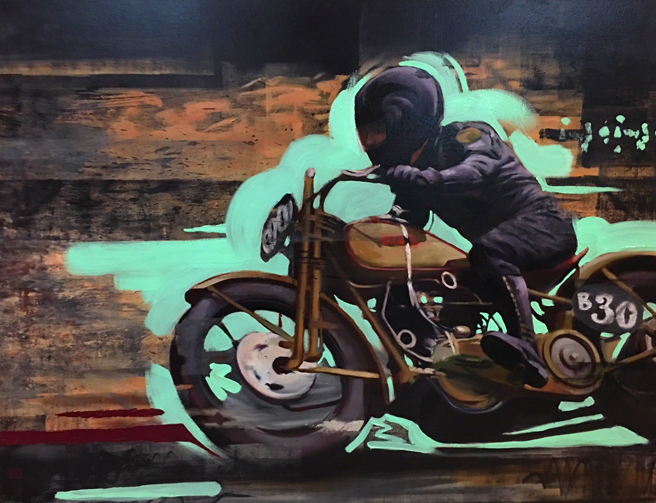 Here are just a few images that caught my attention but you can visit his website is at davidflickart.com to see the full range of his work and follow him on Instagram at dflick. 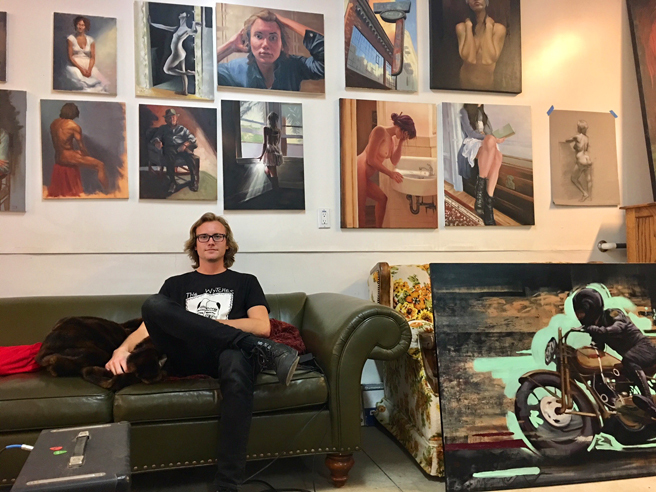 Ok, I had to include another studio shot because just how cool is it to have an aqua VW van in your studio?! 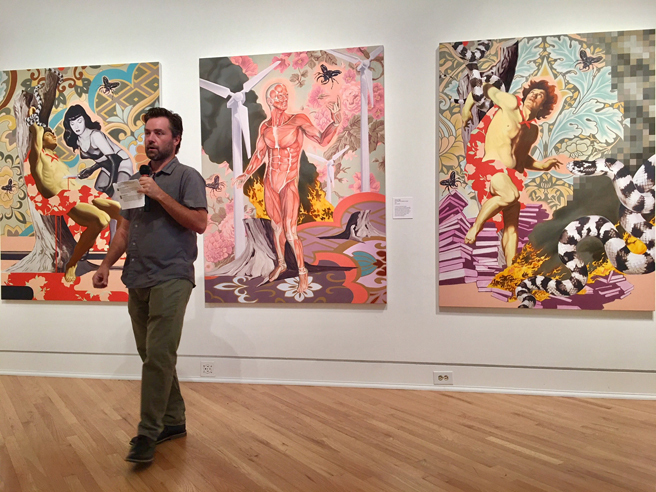 Today Anthony Riggs gave an artist talk as part of the Brown Bag Lunch Lectures at the Triton Museum of Art in conjunction with his exhibition, The Telling of Beautiful Untrue Things (such a gorgeous title)! 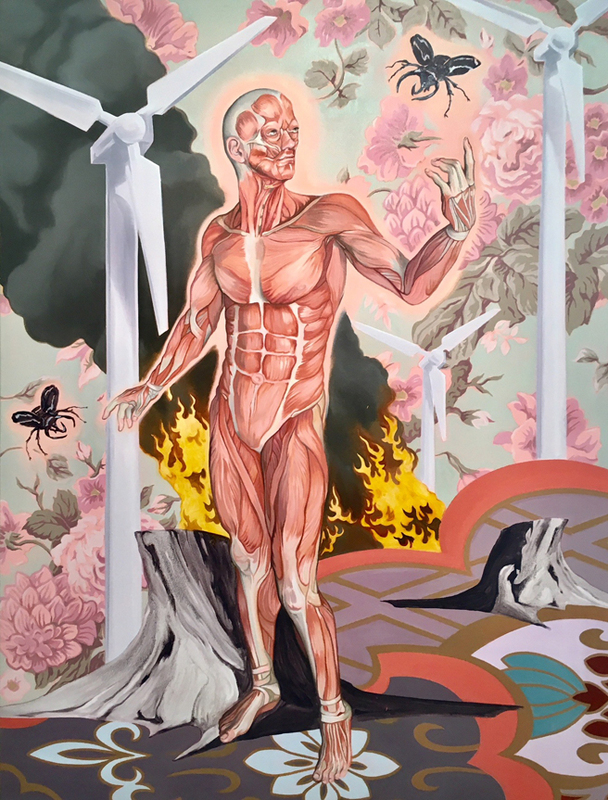 These aesthetically arresting paintings weave historical art imagery and patterns (from both Eastern and Western cultures) with religious and pop allegories and environmental and scientific symbolism. 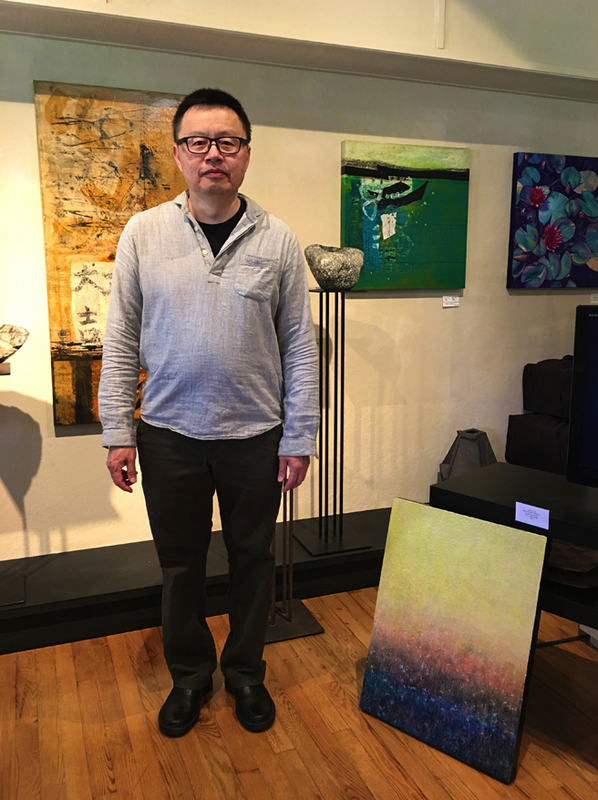 His paintings are studded with post-modern elements such as pixelation, color banding and employ a collaged style in which space, scale, light and color are all intentionally ambiguous. 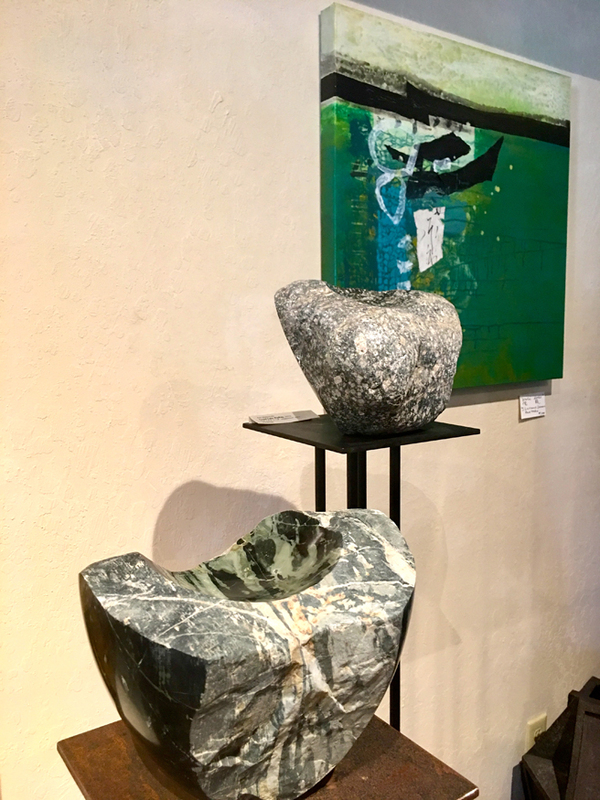 His figures, carefully rendered in three dimensional style, inhabit two dimensional spaces and are even bisected by flat swaths of pattern. 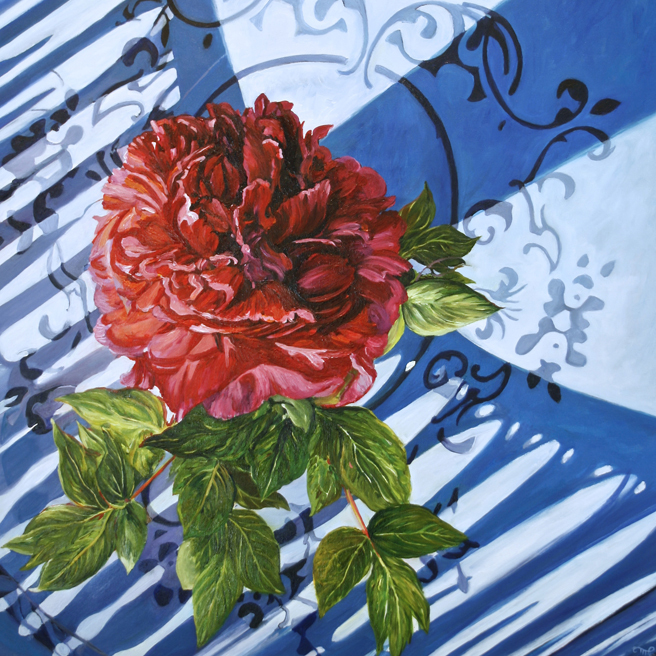 Shadows are purposely inconsistent and color is thoroughly appealing but rarely reliable. 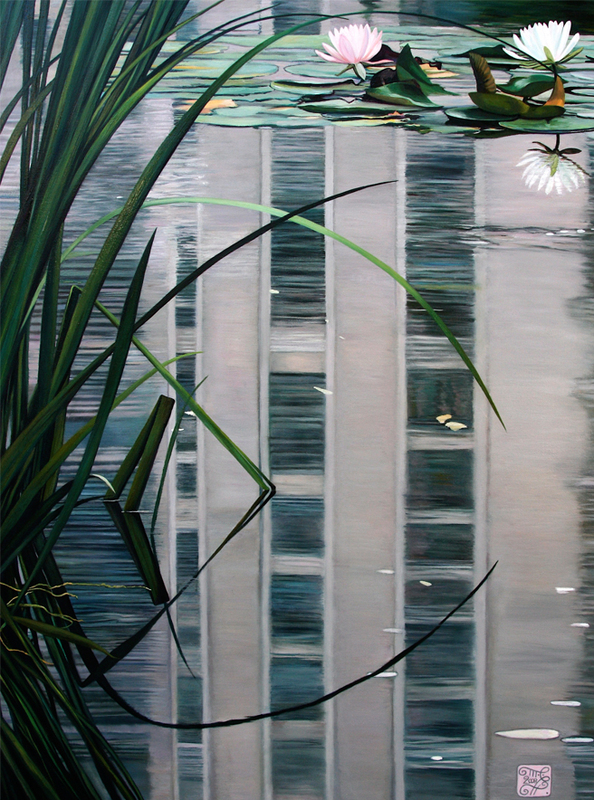 All to underscore the artifice inherent in the the very act of painting. 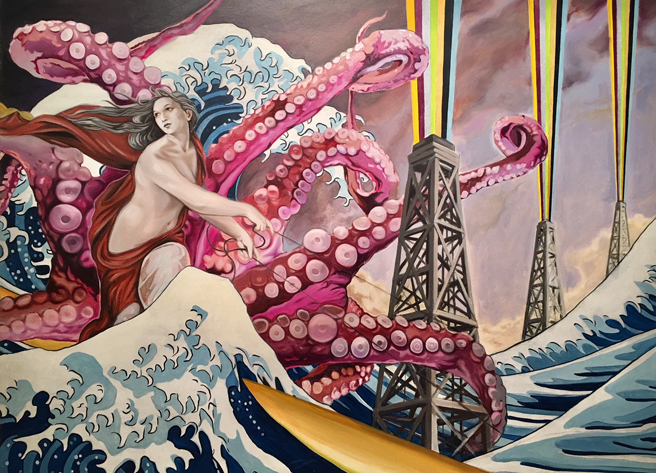 The artist shared a quote from George Orwell that was on his mind as he created this body of work, “All art is propaganda.” In a time before the printing press, the radio, the television, and the internet, there was the power of the painting which was used through patronage of the Church and State and those in power to promote ideology and status. 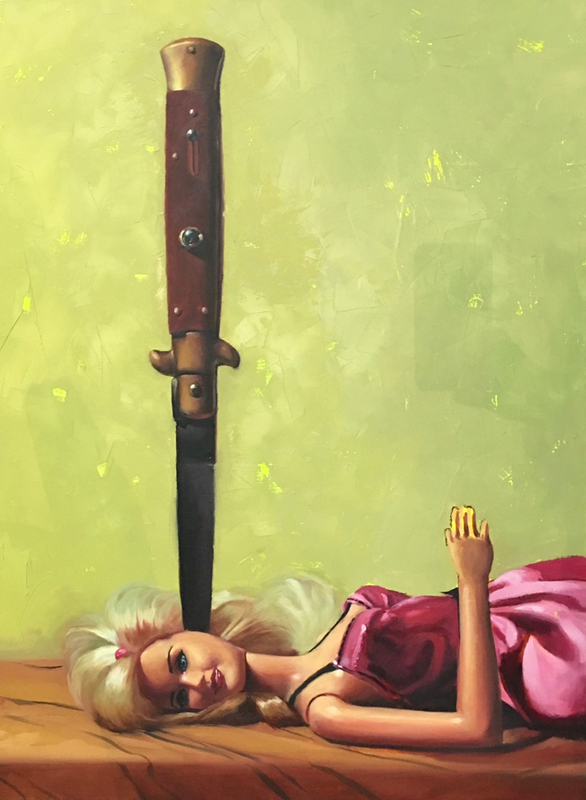 Painting is not truth – art and artifice go hand in hand and that is what Riggs is emphasizing in his seductive, apocalyptic paintings in which opposing ideologies and power dynamics intertwine in conflict without answers but leaving room for more questions. 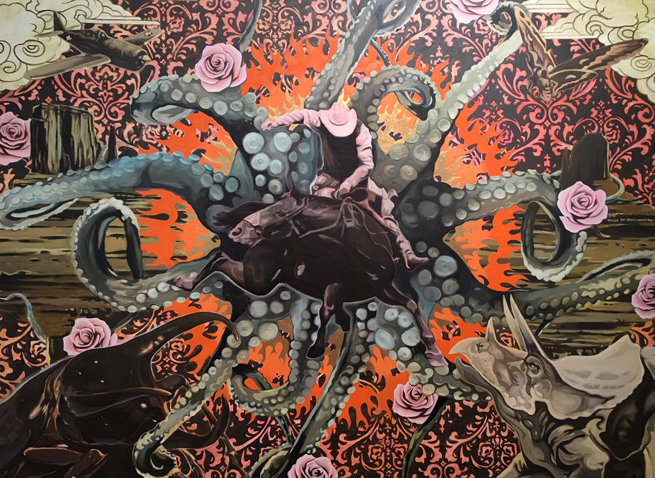 It is a good time to be questioning and seeking one’s own truth in this age of the internet where fake news and propaganda flows fast and furious and purposely muddies the waters between fact and fiction. 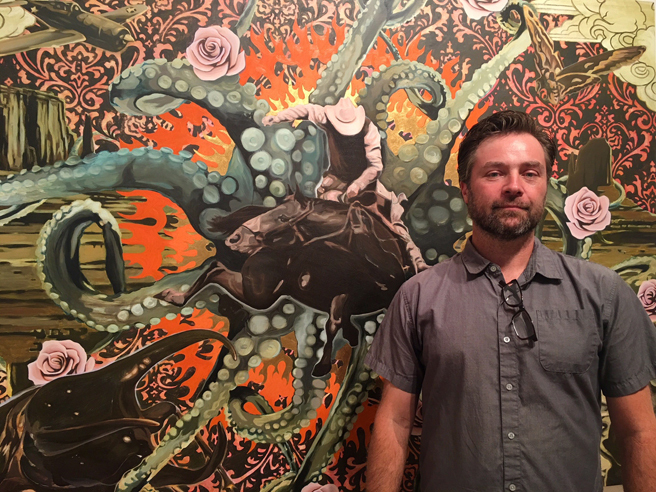 Anthony Riggs is based in Benicia, California. 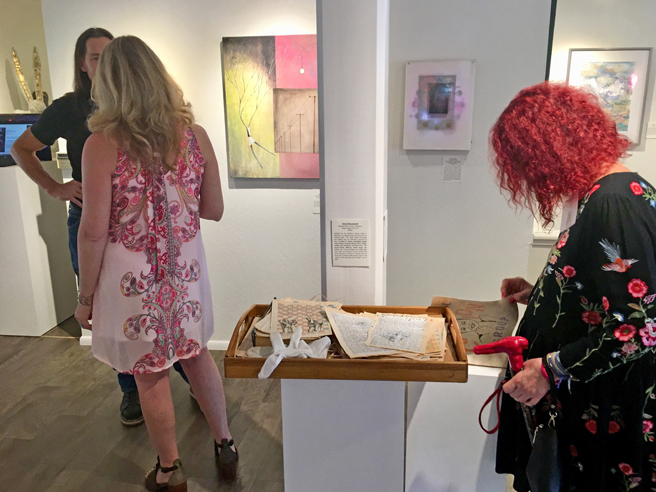 You can visit his exhibition, The Telling of Beautiful Untrue Things, which runs until August 5 at the Triton Museum of Art in Santa Clara, California or visit his website, anthonyriggs.com. 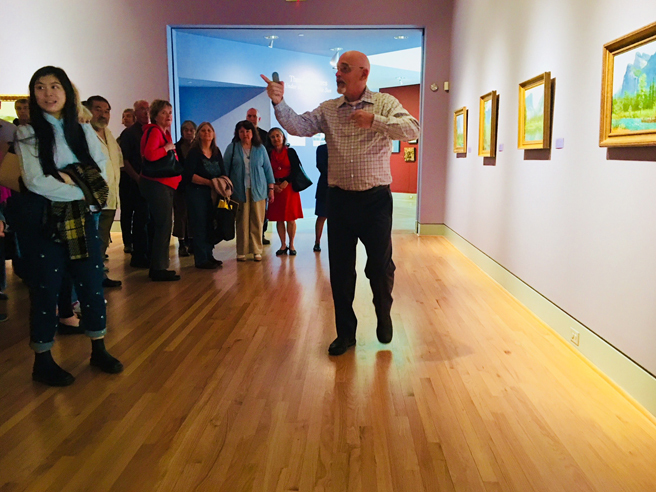 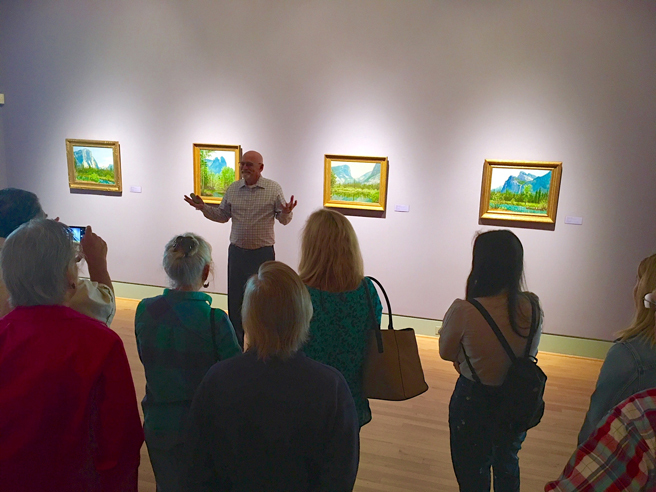 What a pleasure to learn more about Theodore Wores, California Impressionist painter (1859-1939) over my bag of almonds at the Triton Museum of Art’s Brown Bag Lunch series conducted by Deputy Director, Preston Metcalf today! 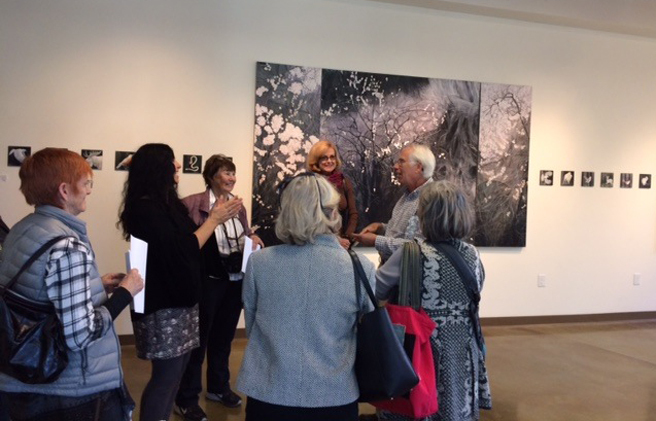 The Triton has 47 of his paintings in their permanent collection, a generous gift from his wife, Caroline Bauer. 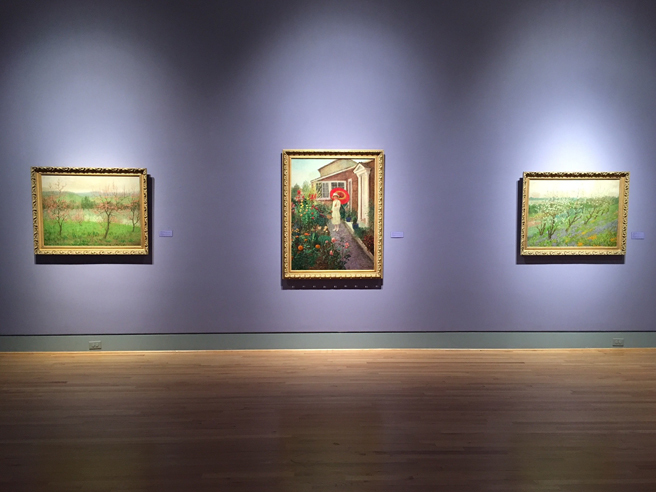 A good number of these pieces were recently cleaned and restored and are included in this exhibit, Under the California Sun, which consists of landscapes painted in the San Francisco Bay Area and Yosemite. 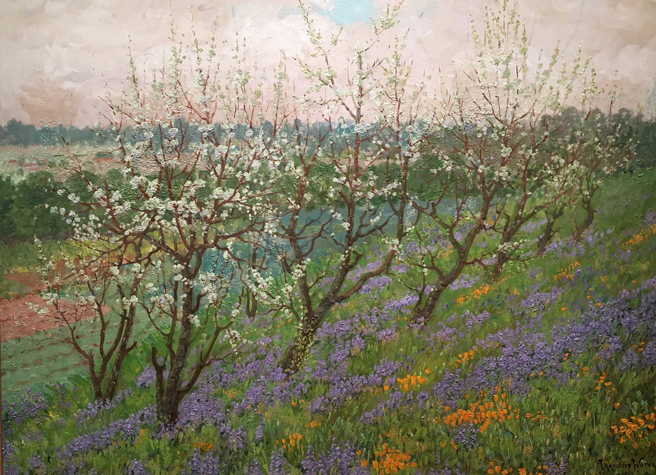 Many of his orchards were painted right here in Los Gatos and Saratoga and are so special to me as I grew up in the Annapolis Valley of Nova Scotia, surrounded by orchards. 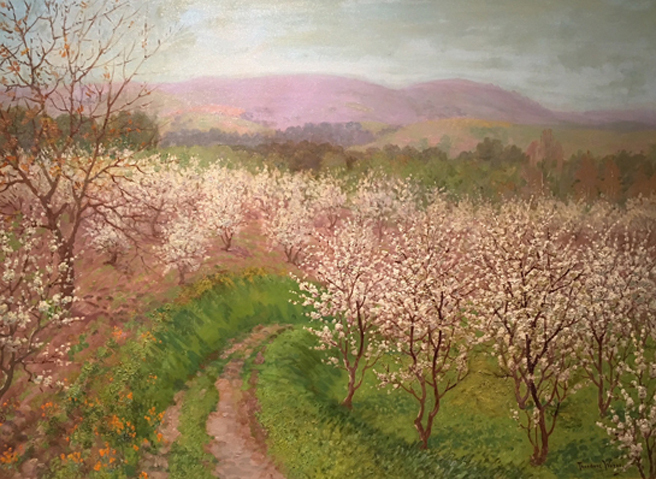 In fact, they are actually kicking off their annual Apple Blossom Festival today! 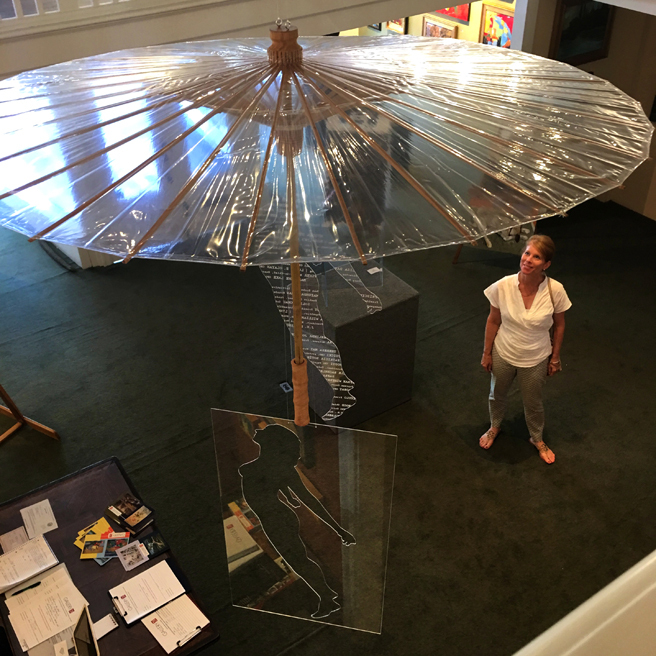 Under the California Sun will continue at the Triton until July 29 when it will go on tour! 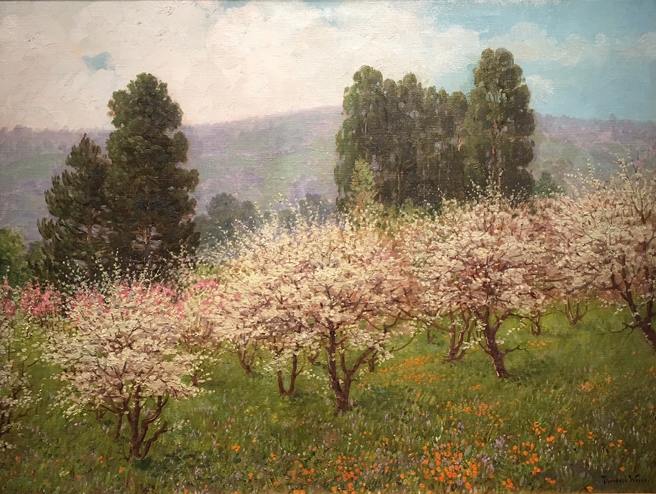 Theodore Wores – Spring Blossoms of California – Los Gatos – 1919 – oil on canvas. 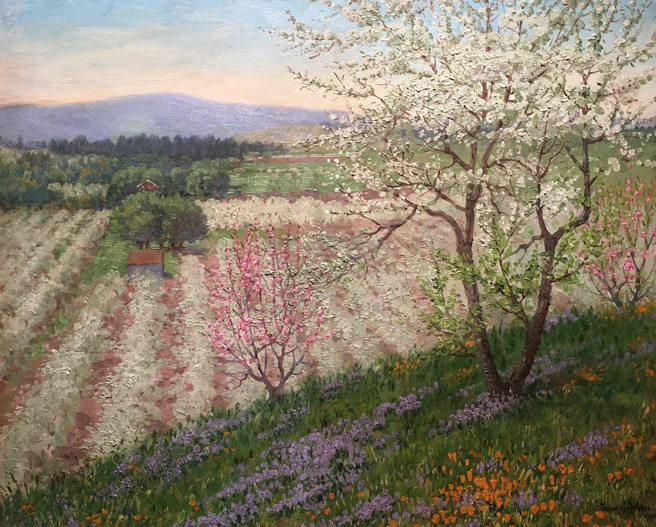 Theodore Wores – Blossomtime, Saratoga, California – 1919 – oil on canvas. 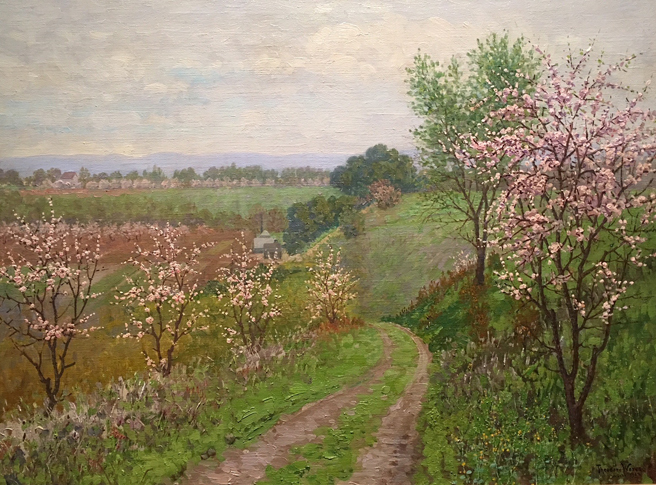 Theodore Wores – Road with Blossoming Trees – 1922 – oil on canvas. 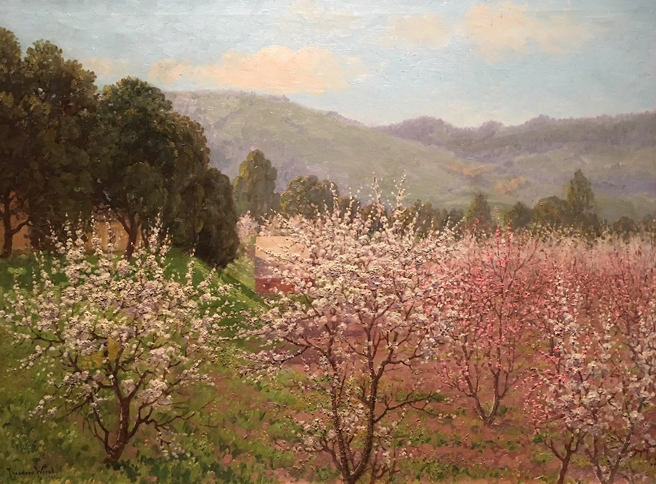 Theodore Wores – Spring Blosoms of Los Gatos – 1925- oil on canvas. 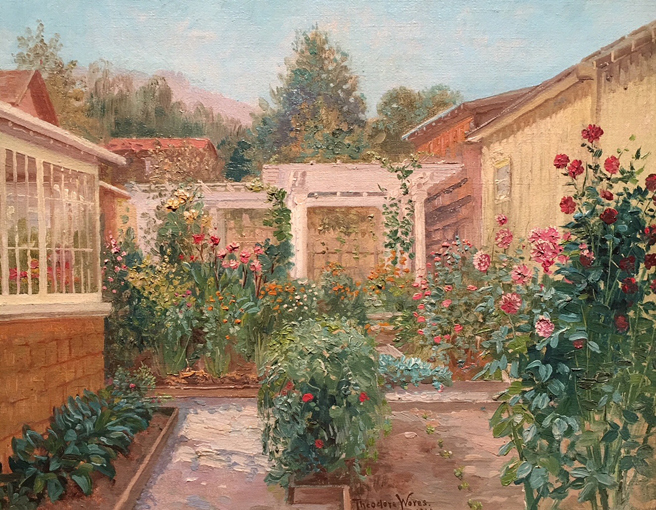 Theodore Wores – My Studio Garden in Saratoga, Ca. 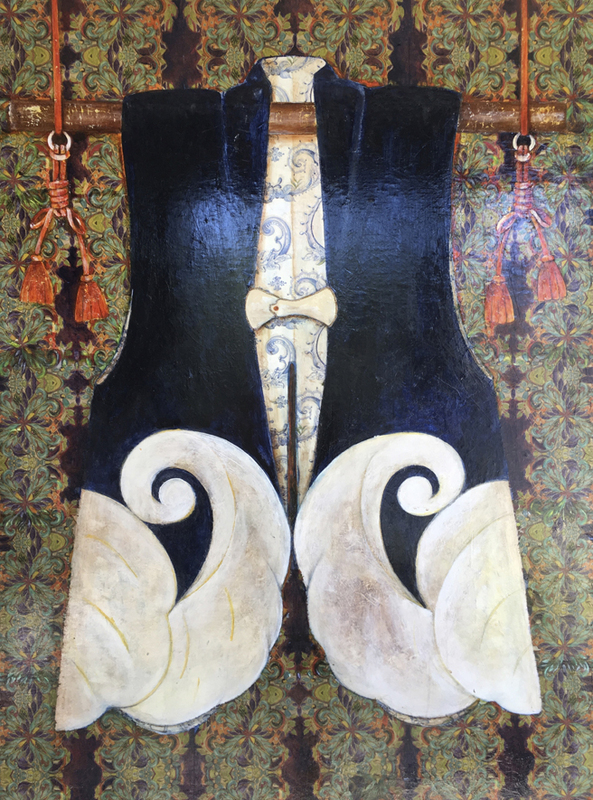 – 1926 – oil on canvas. 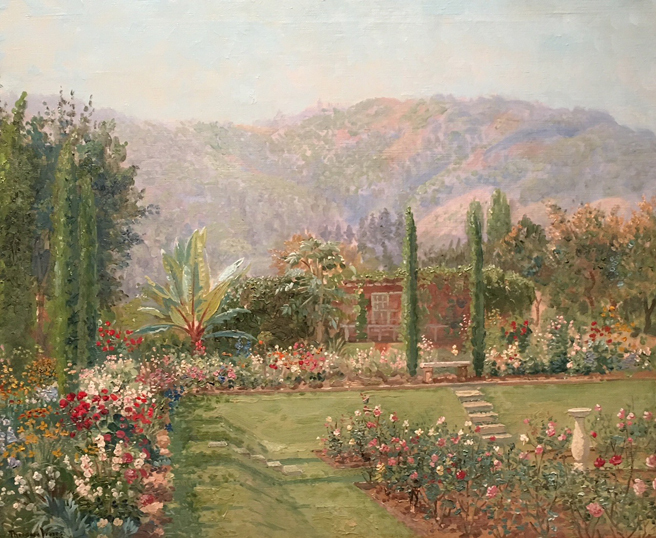 Theodore Wores – A Garden in Saratoga, California – 1927 – oil on canvas. 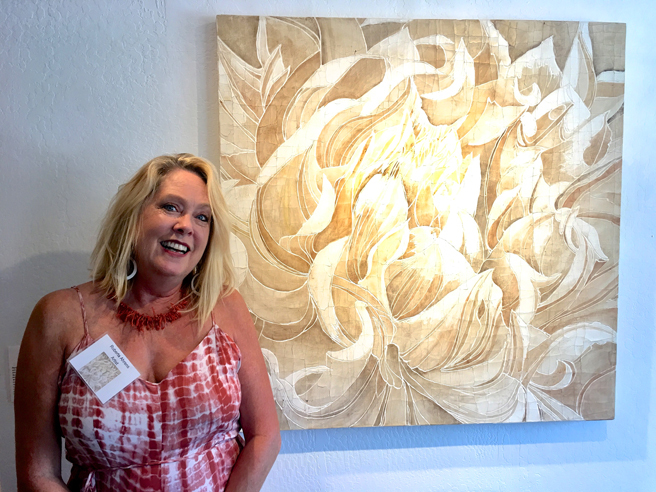 Want to see more Wores? 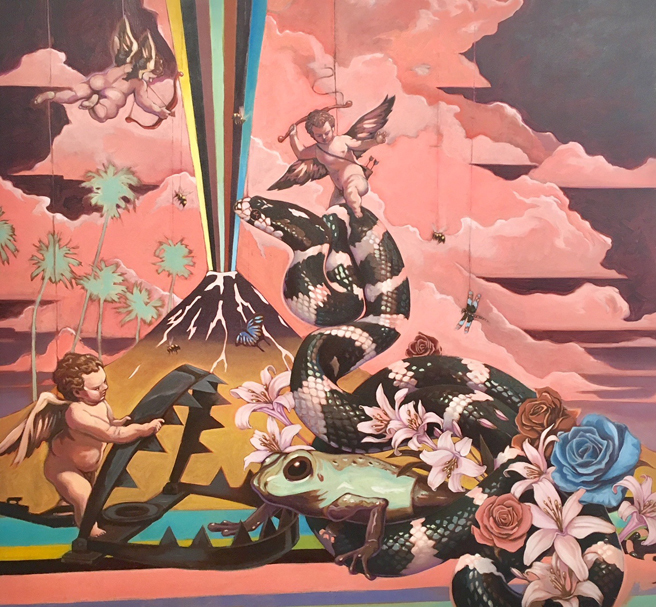 The Triton has a batch of paintings he did in Spain that need the same loving (read professional and expensive) cleaning and restoration that these pieces had. 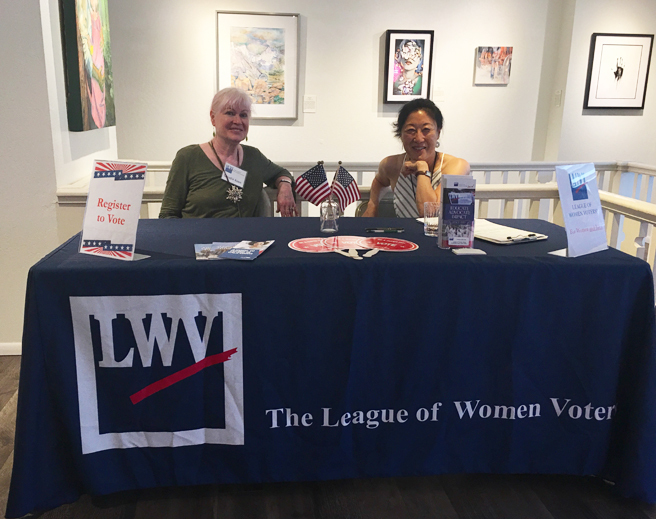 They are gratefully seeking financial donations (to bridge the gap in grants)…just saying! 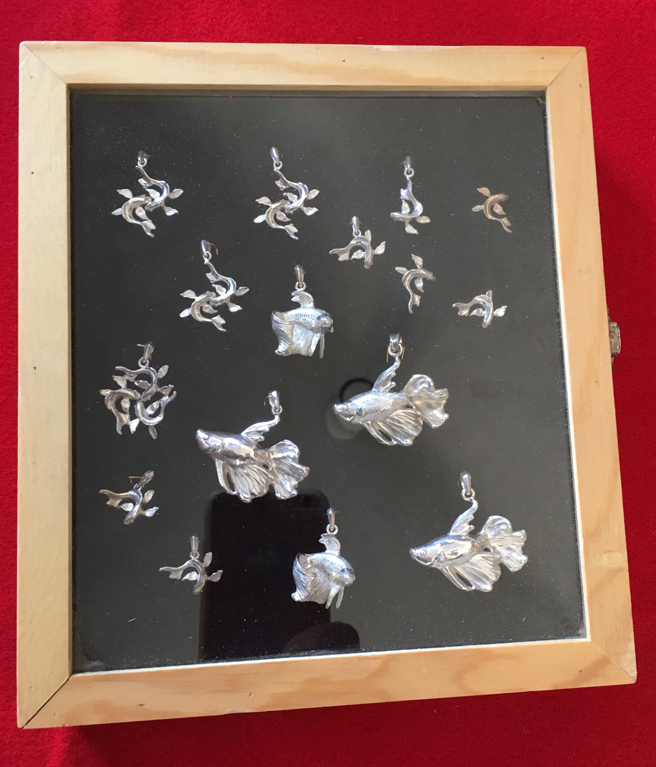 How exciting…. 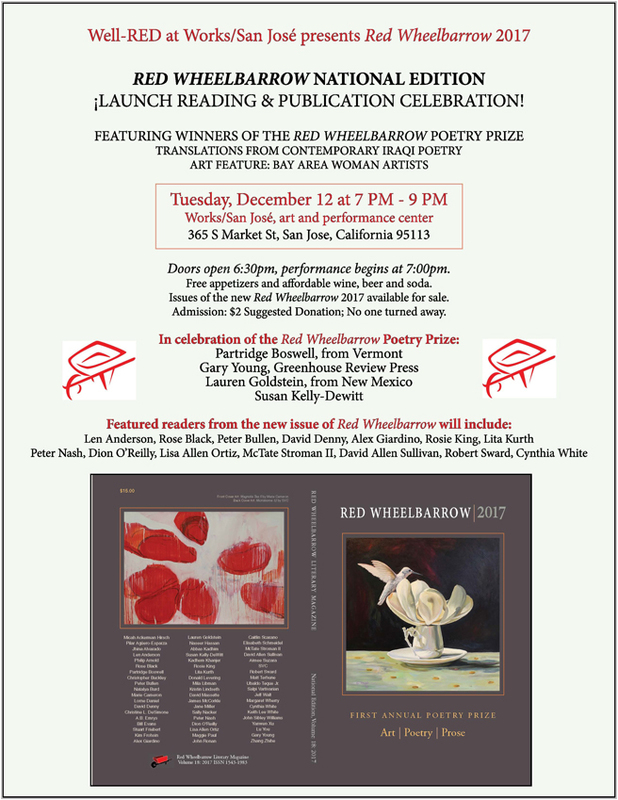 the book launch for the national edition of the Red Wheelbarrow is this Tuesday, December 12 from 7-9 pm at Works/San José, 365 Market Street, San Jose, California! 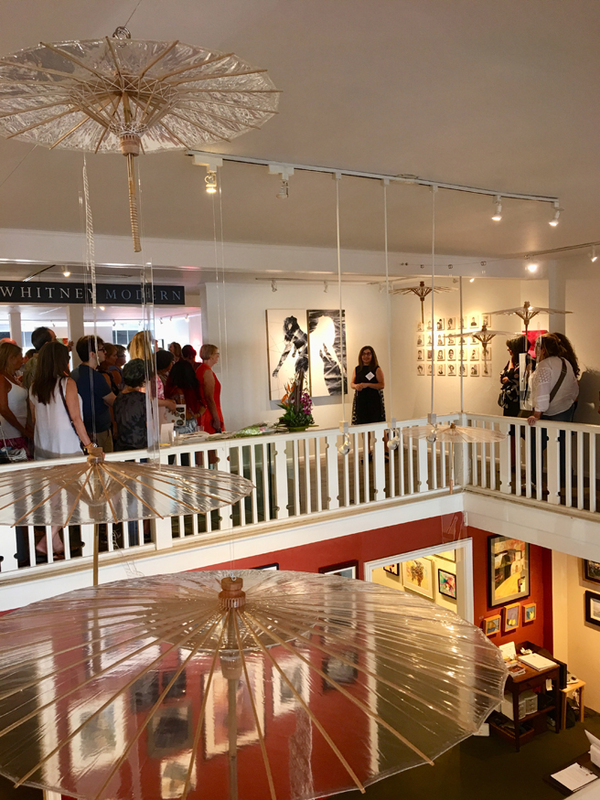 Doors open at 6:30pm and performance begins at 7:00pm. 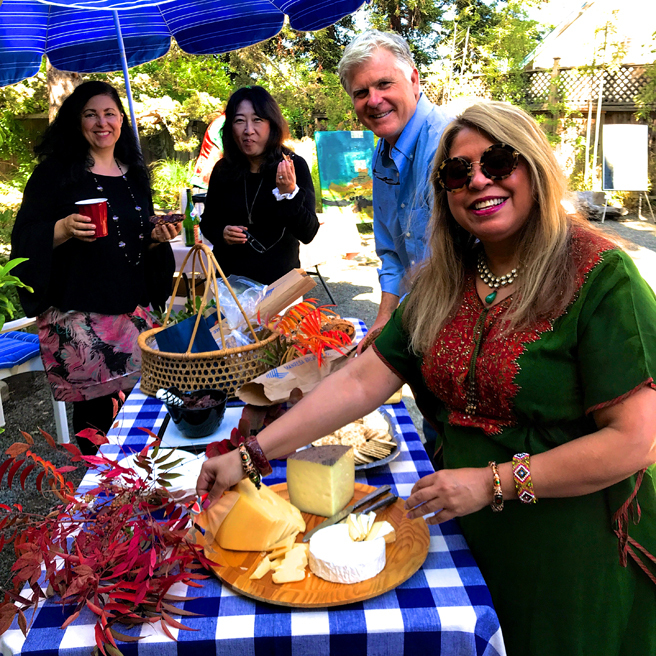 Free appetizers and affordable wine, beer and soda. 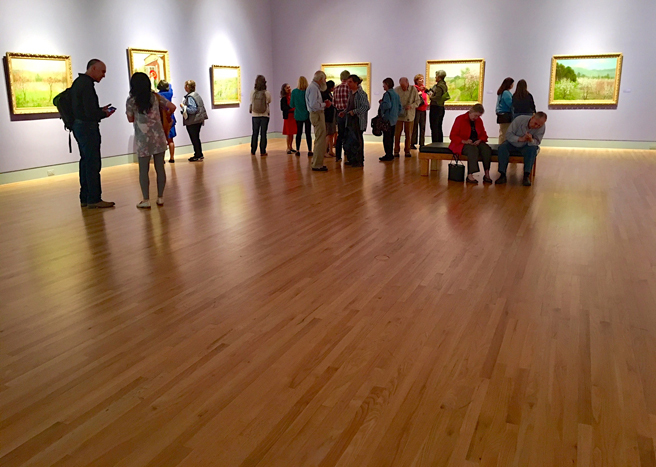 Suggested admission $2 – but no one will be turned away. 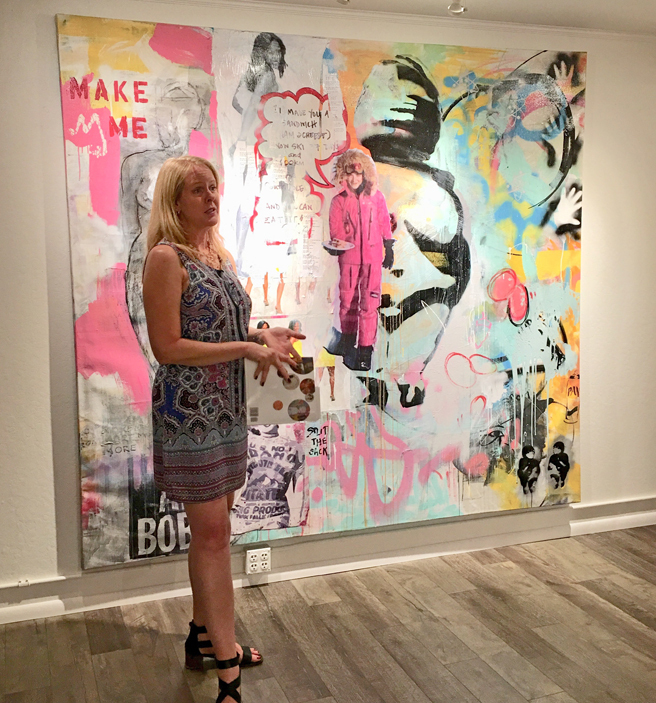 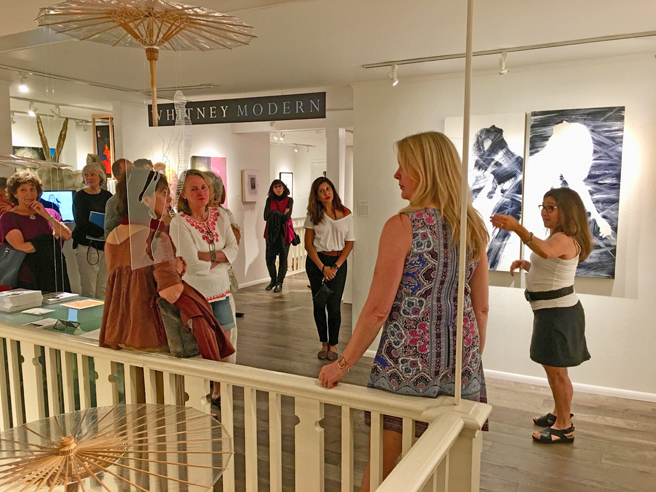 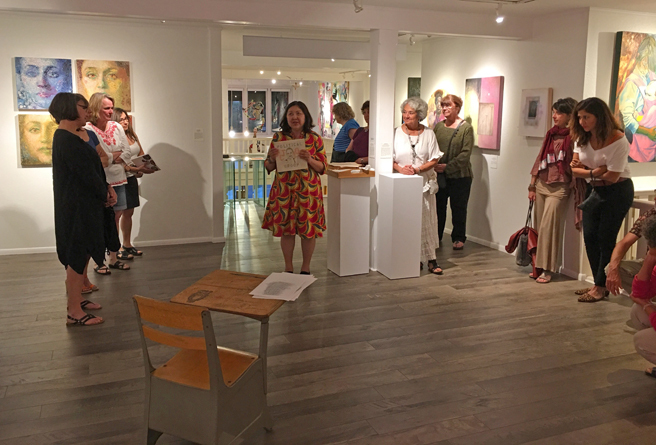 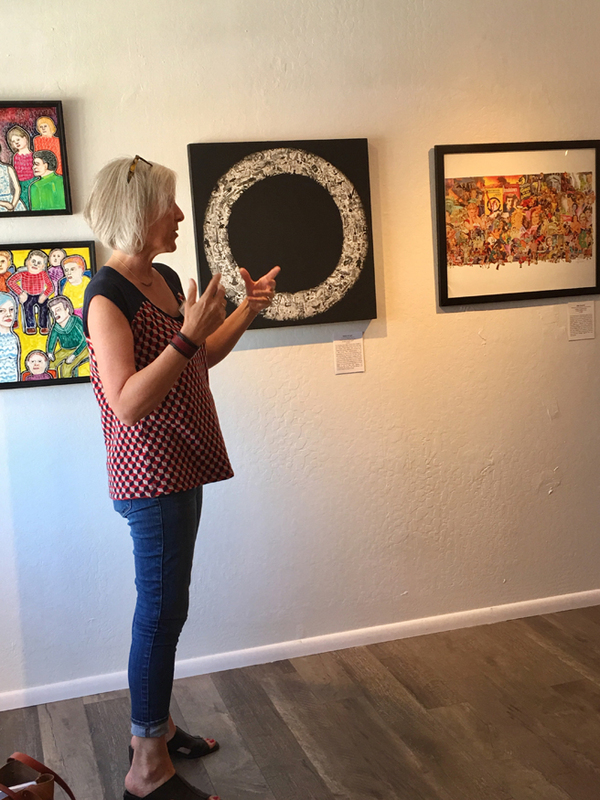 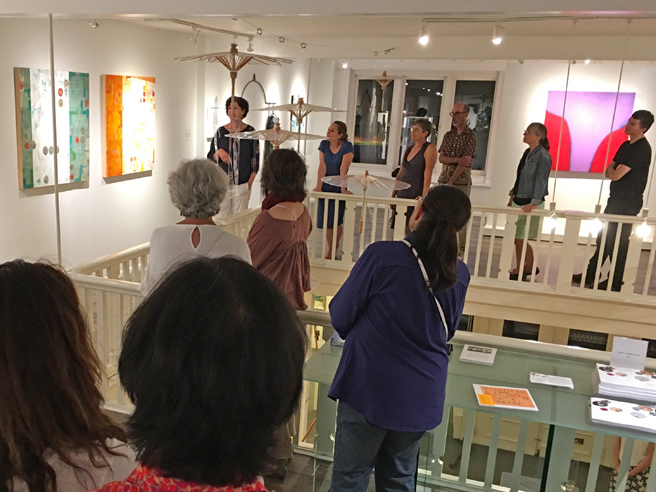 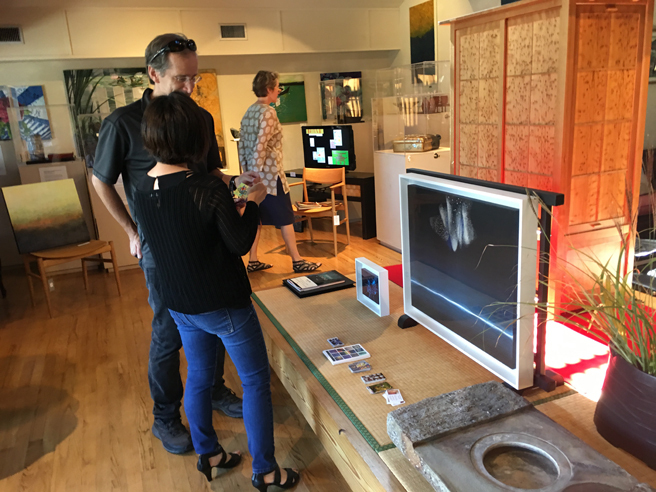 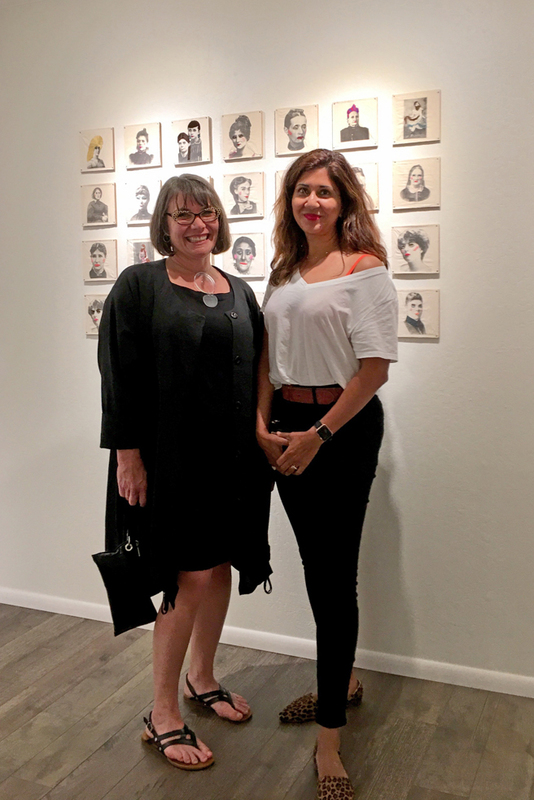 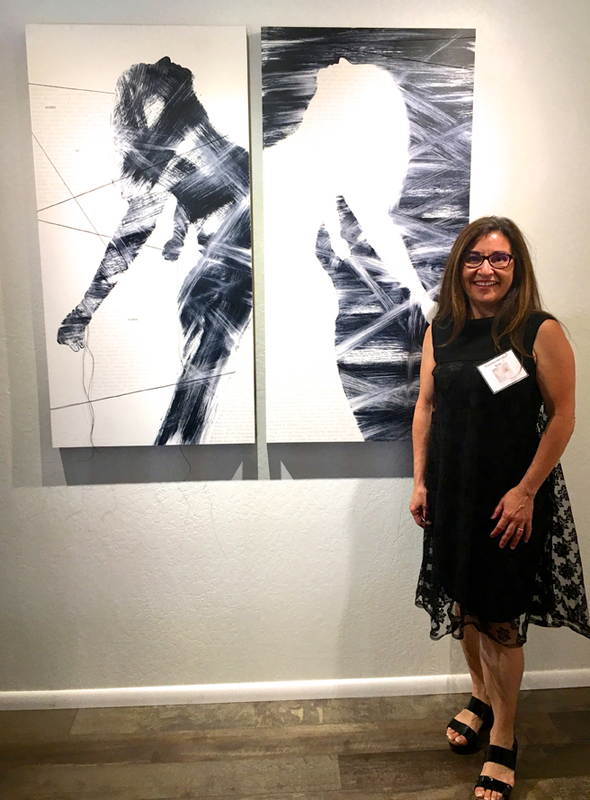 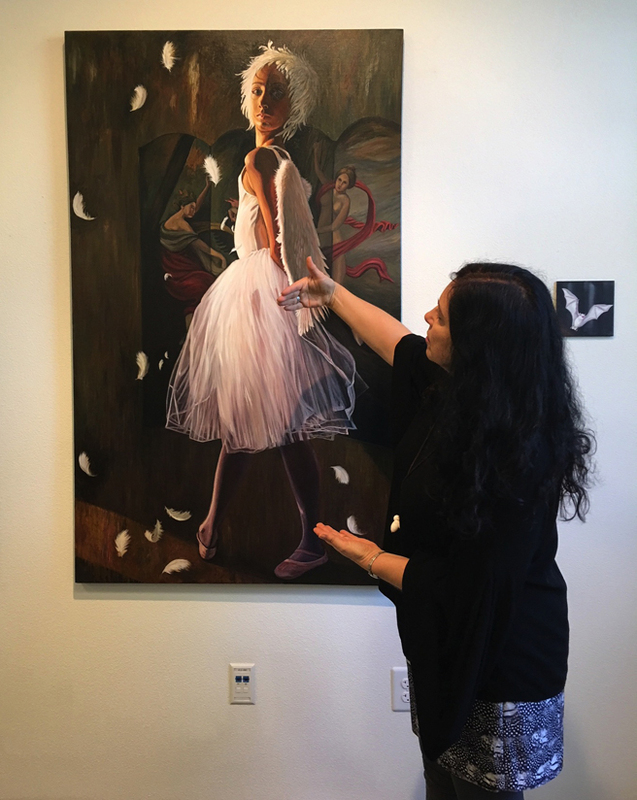 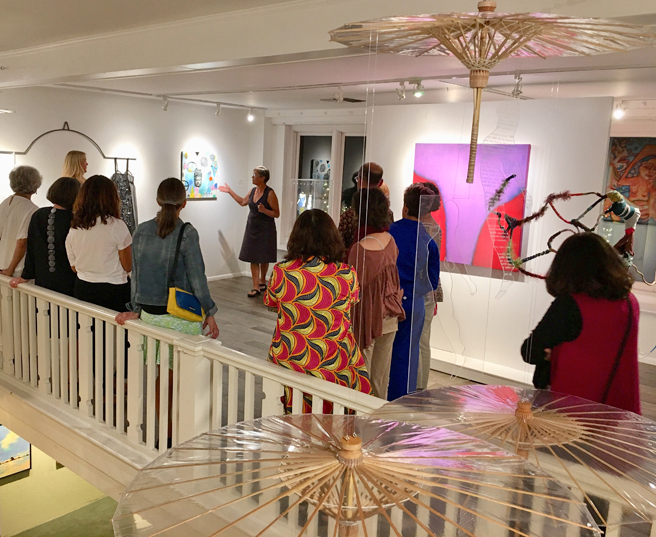 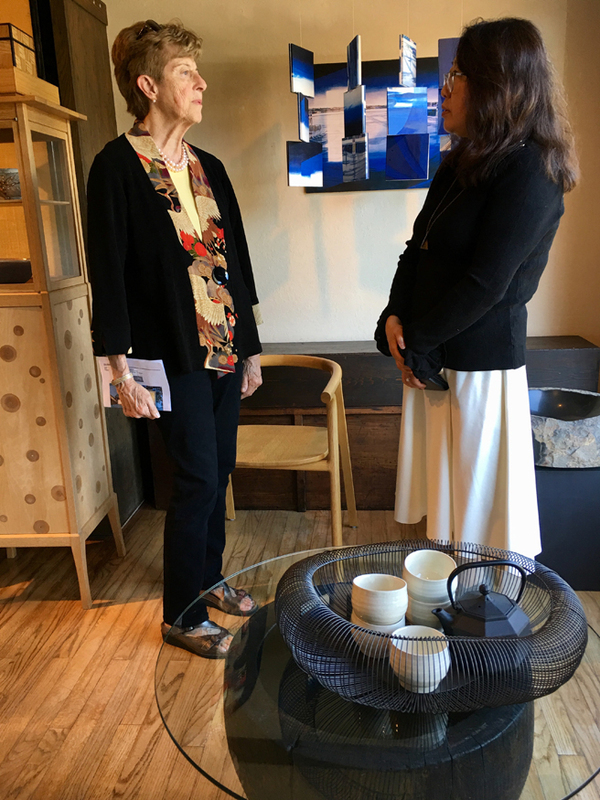 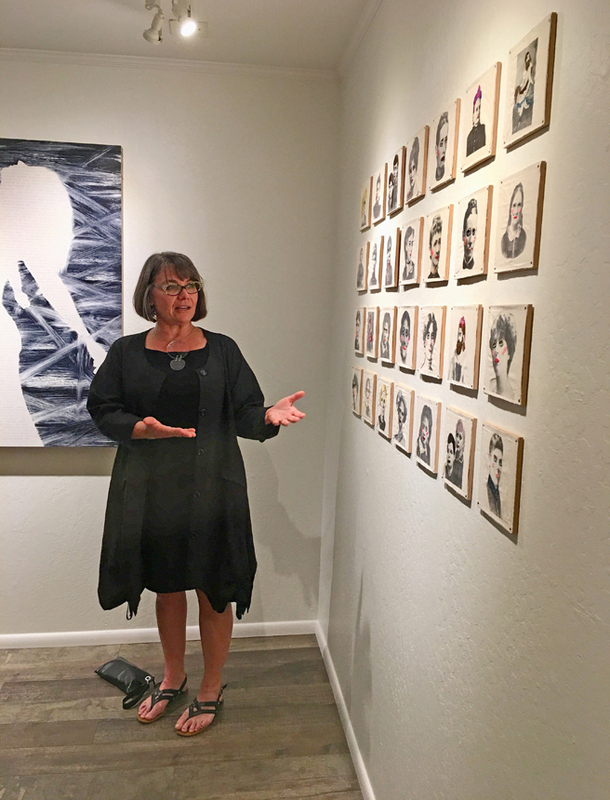 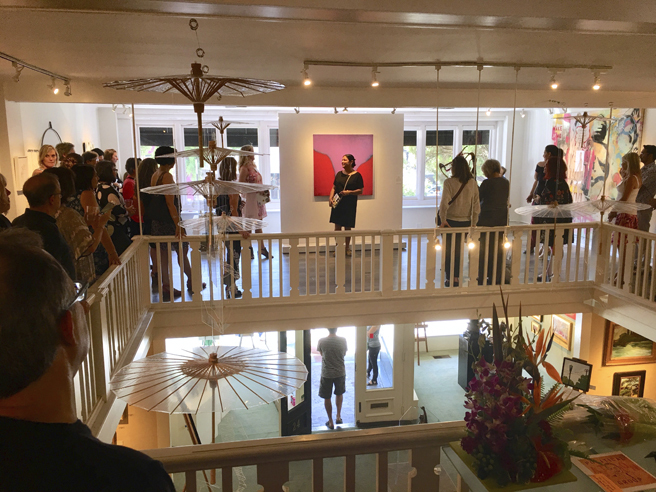 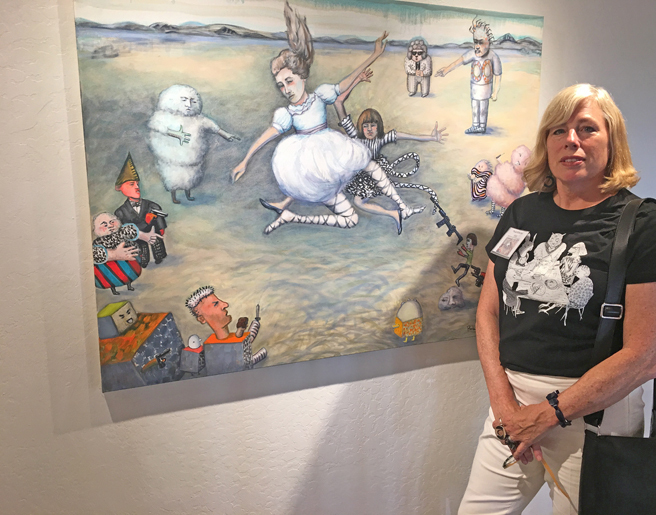 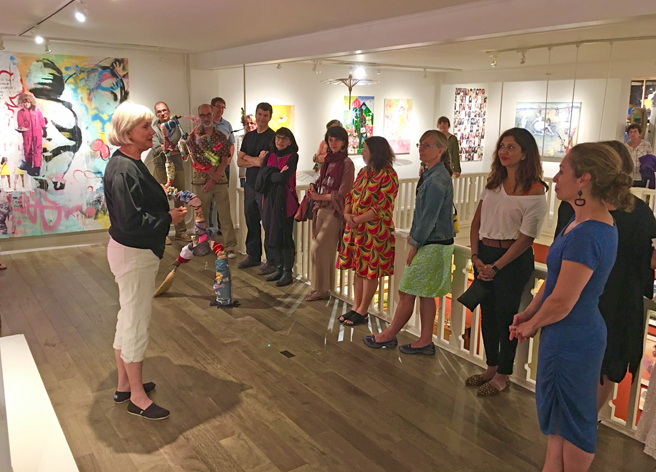 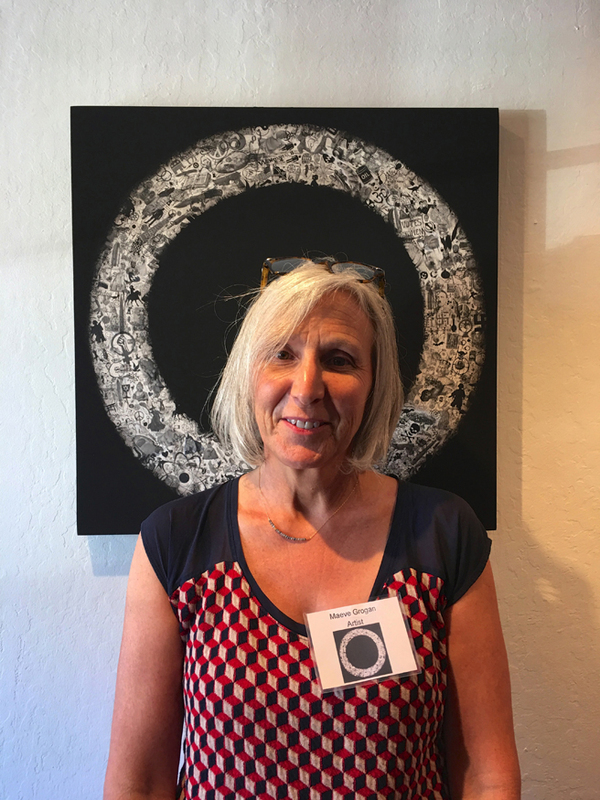 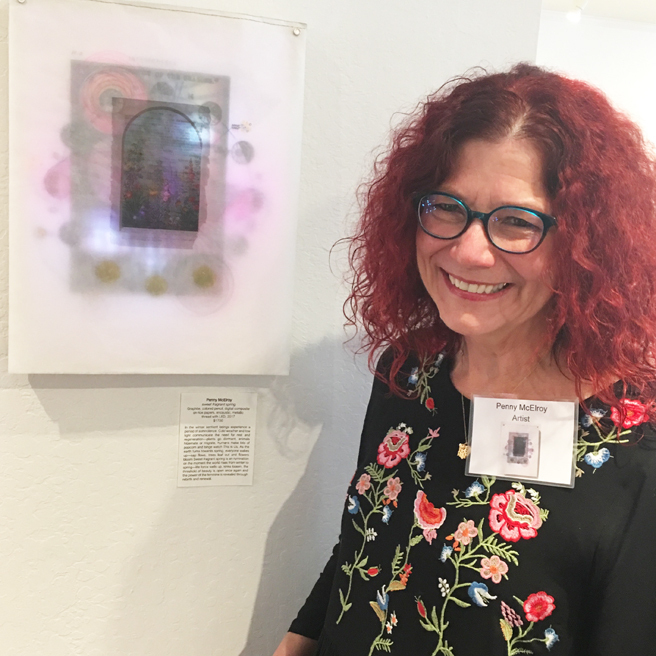 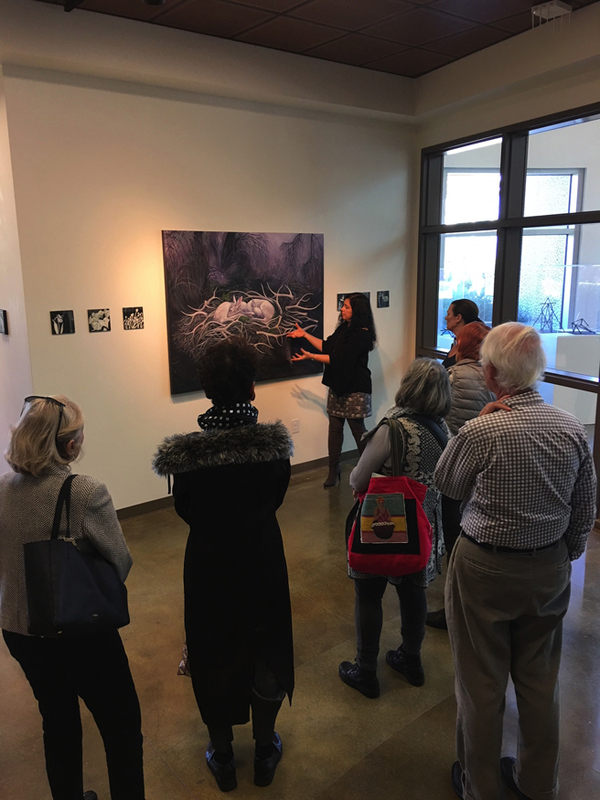 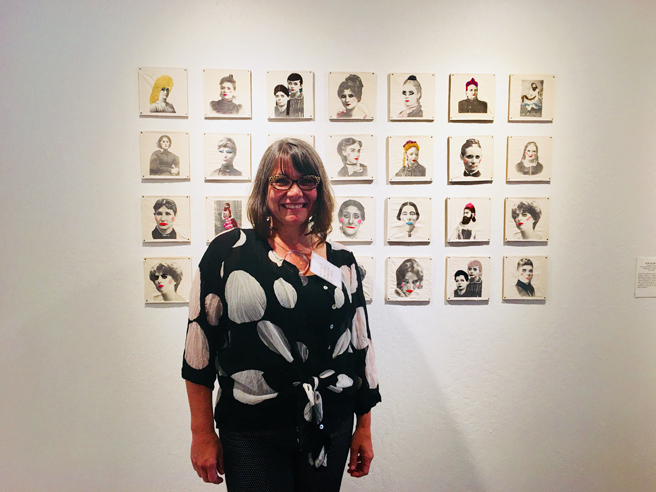 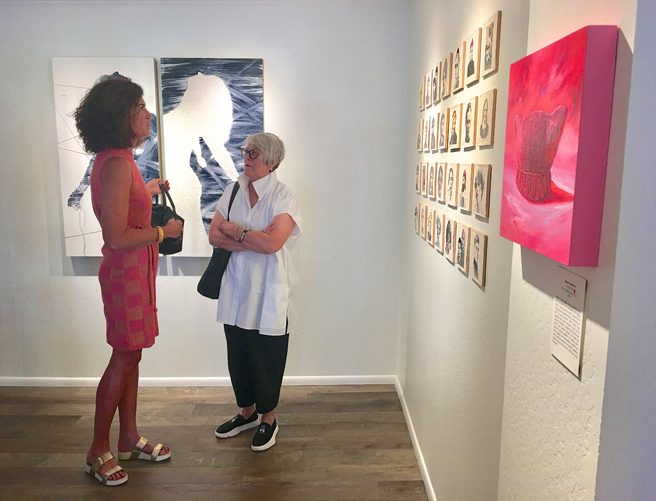 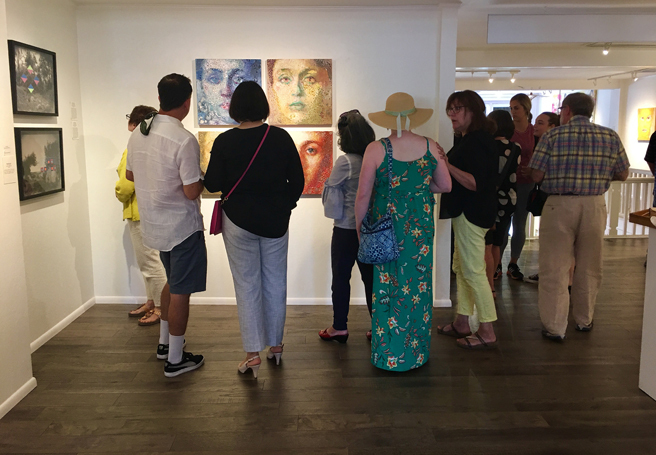 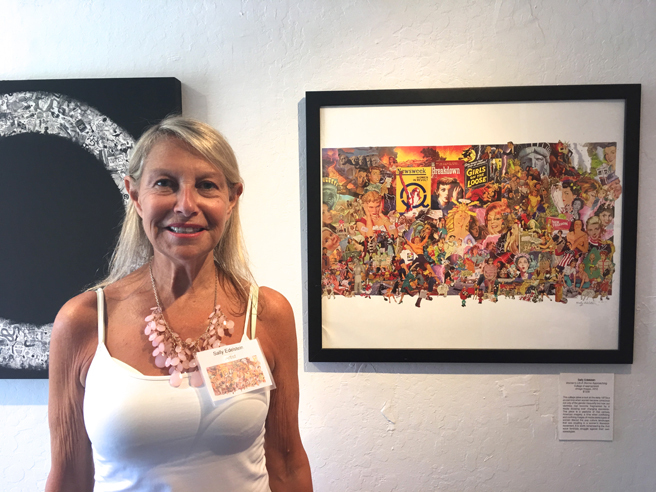 I was delighted to give an impromptu Artist Talk at Fade (my solo show at Vargas Gallery at Mission College) prompted by my friend artist Lorraine Lawson who kindly rounded up a great group which included people with backgrounds in galleries, marketing and art. 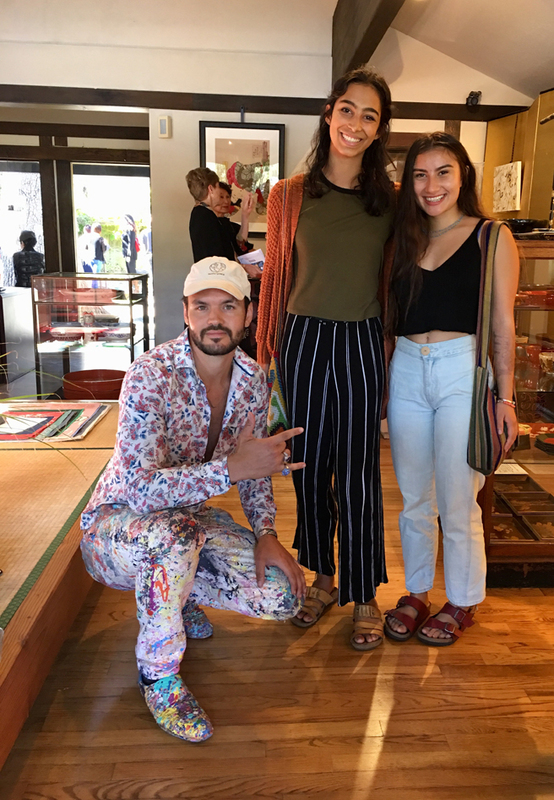 It is a special thing when artists come out to support other artists! 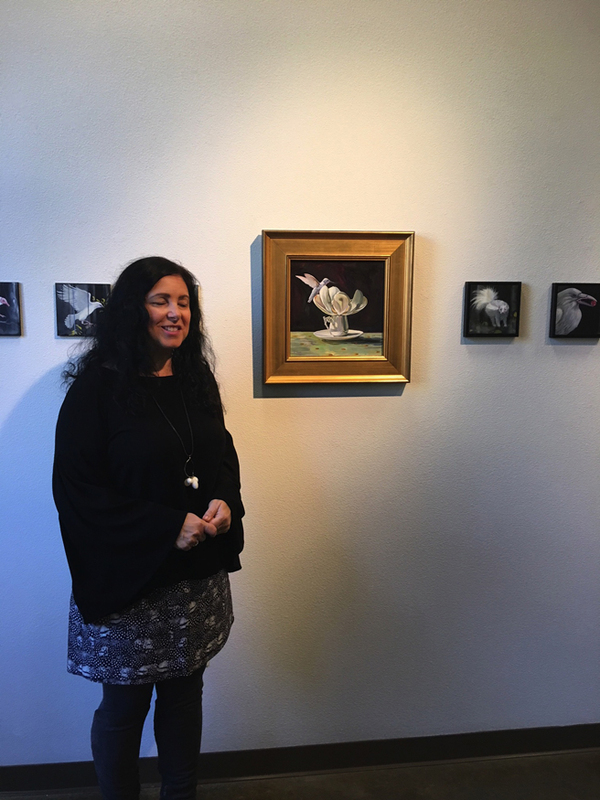 I loved sharing the stories behind these paintings, how I choose both medium and technique to help tell the tale and the symbolism I try to employ. 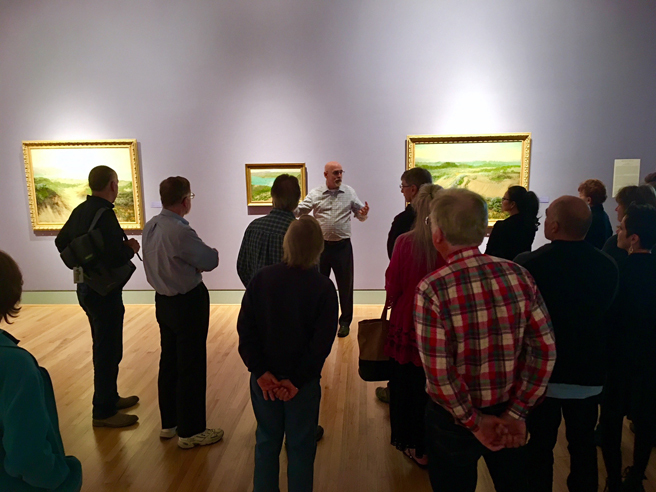 Telling the story behind Blooming Deadwood. 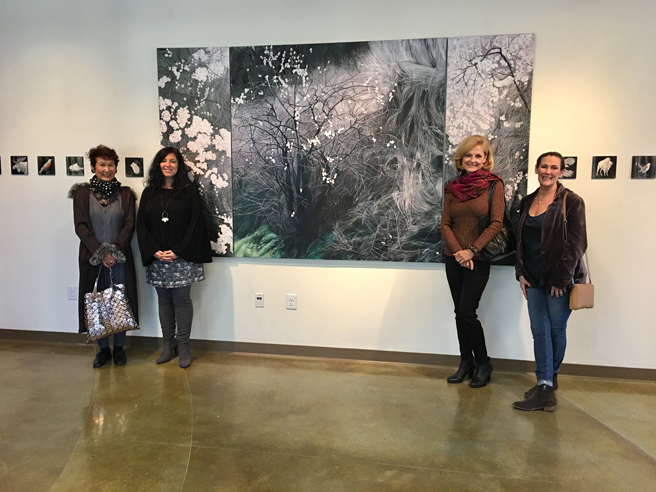 So nice to see artists Veronica Gross, Dotti Cichon, Lorraine Lawson and Linda Benenati! 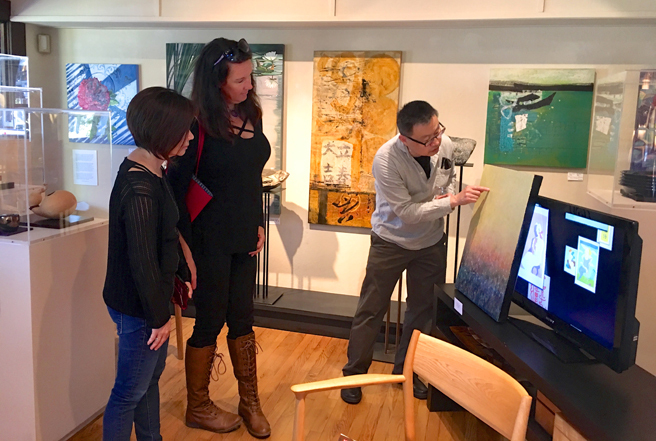 We are enjoying the suggestion that I get a scissor lift for my paintings like Hung Liu uses! 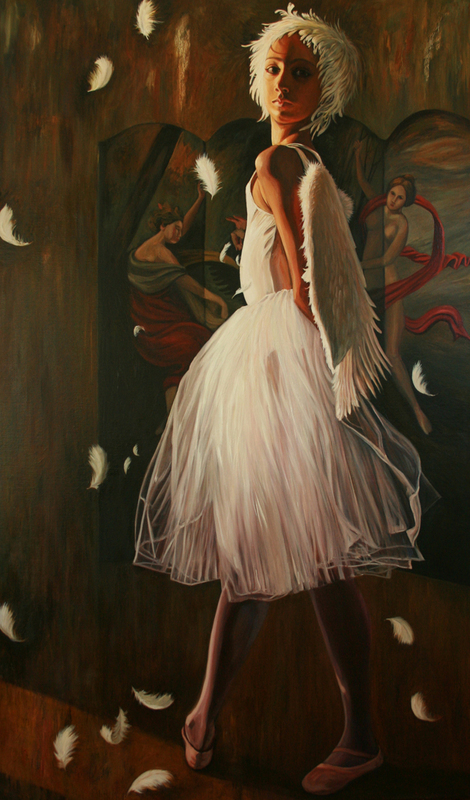 Sometimes you can better see what’s in your heart with your eyes closed. 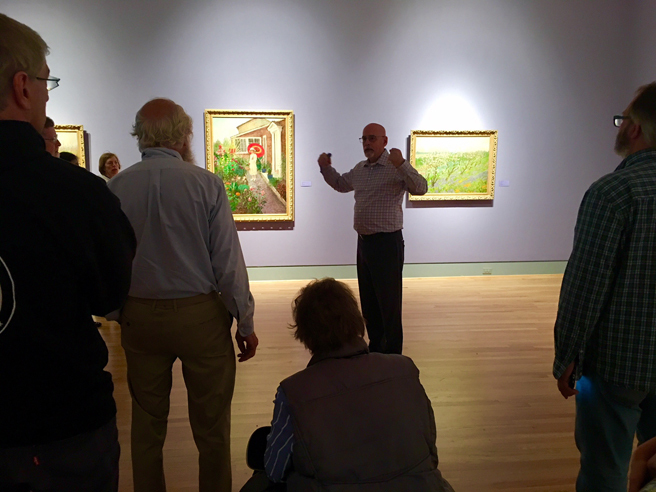 Talking about employing chiaroscuro (light /dark) in both the lighting of the figure but also more figuratively in the lightness of the feathers and the darkness of the Bacchanal in the folding screen. 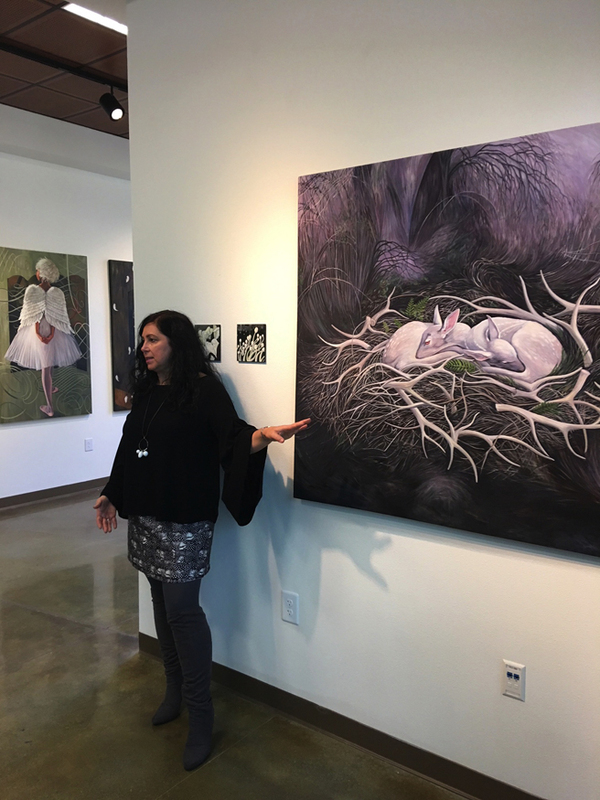 Talking about combining different experiences to create an image, the albino deer of Pine Mountain Lake, the dormant forest at Picchetti, a nest of branches at Kirkwood, the fawns that visit my backyard and the antler drops I have in my studio. 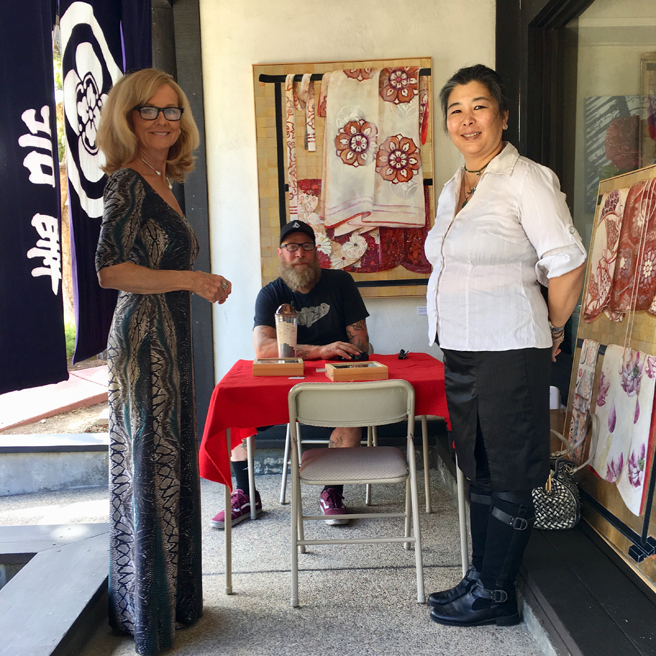 With gallerist Kumiko Iwasawa, Lorraine Lawson and designer Robin Sedgewick. 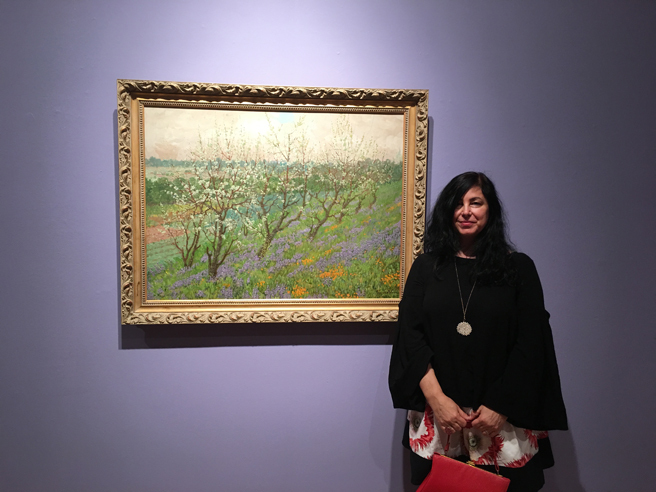 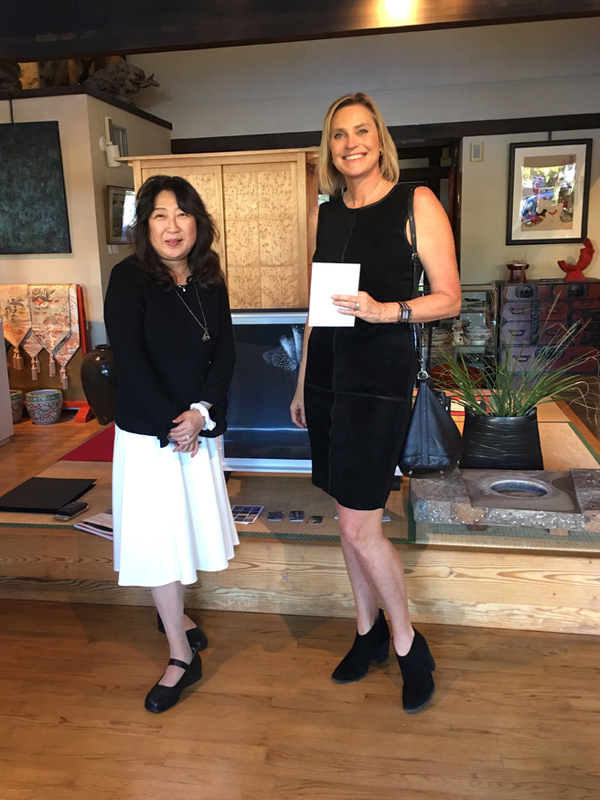 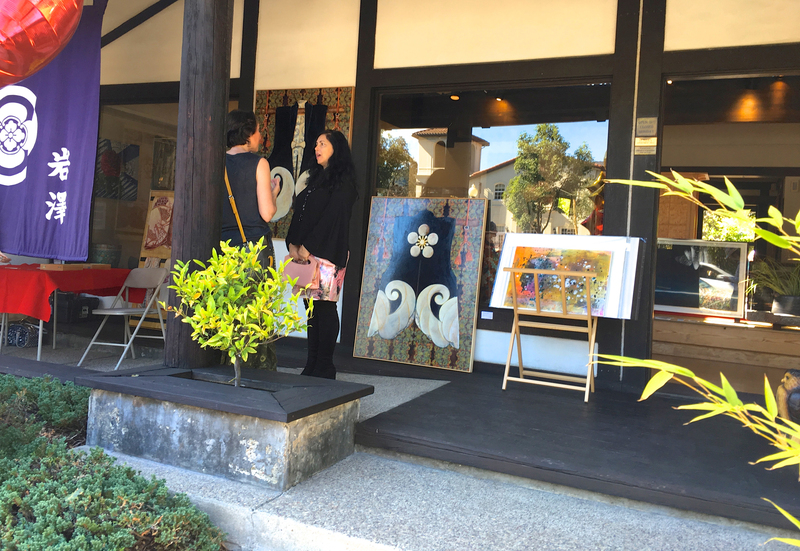 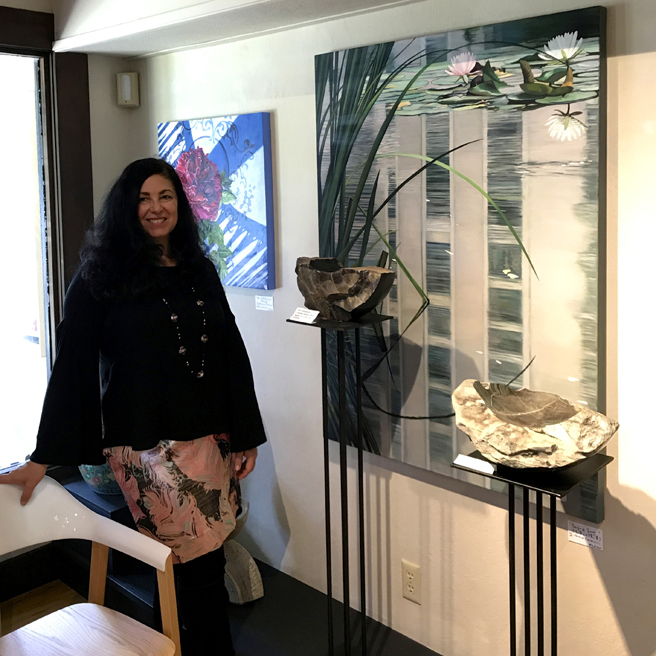 Kumiko Iwasawa in front of Blooming Deadwood – we spoke of exhibiting at her gorgeous gallery, Iwasawa Oriental Art, in the spring! 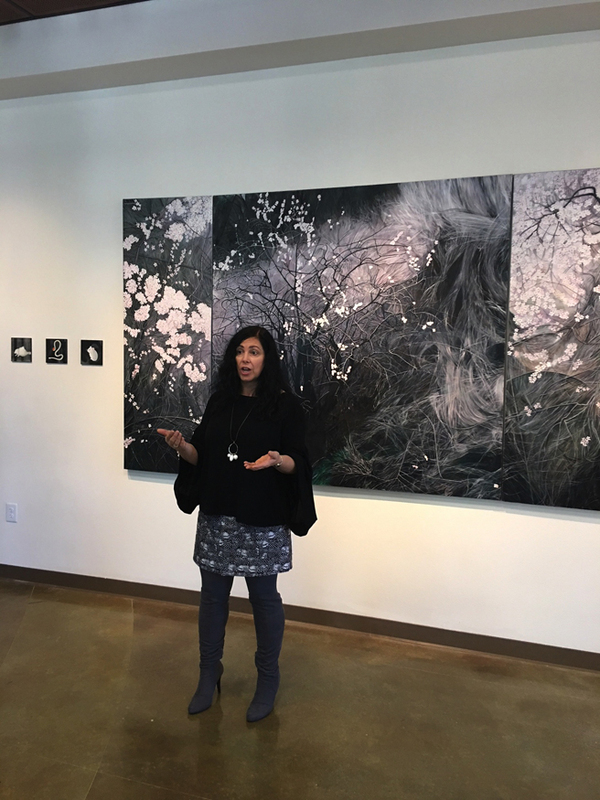 Please join me for a conversation with curator Marianne McGrath at NUMU tomorrow, Saturday, November 4th. 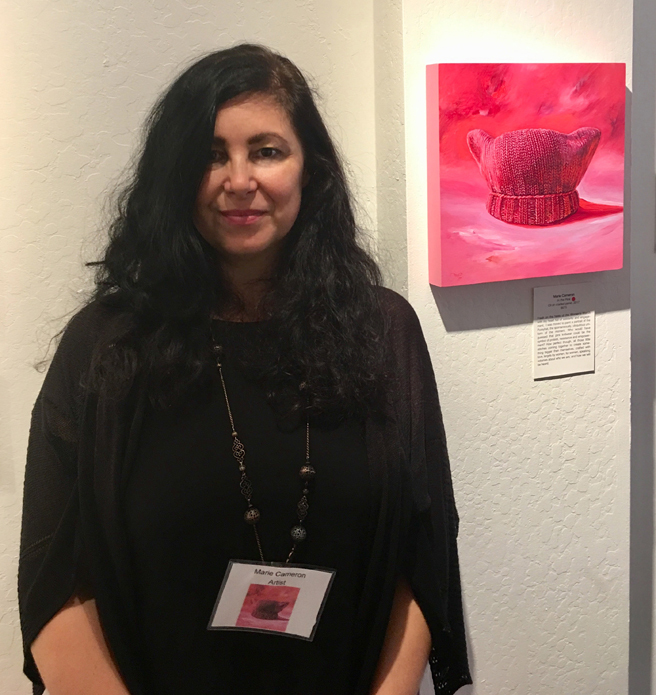 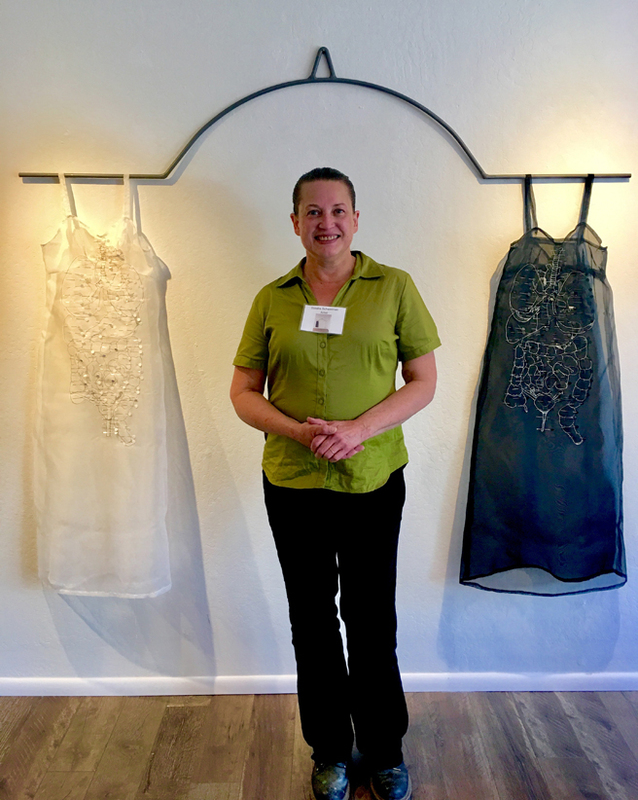 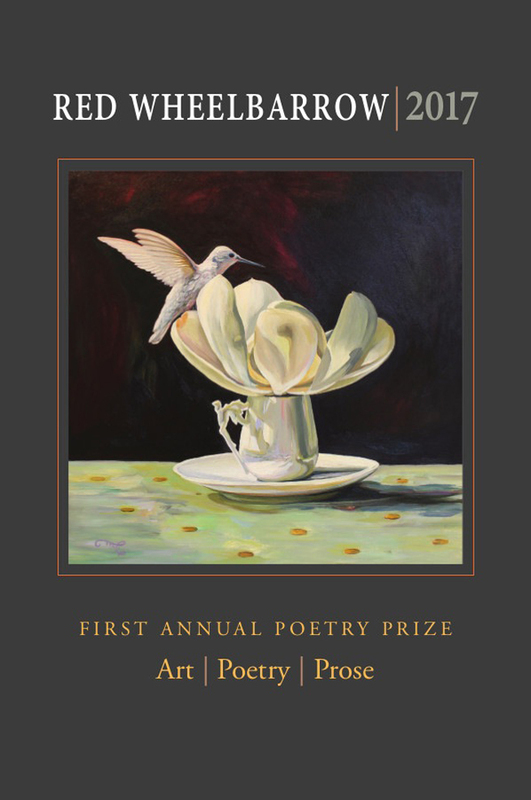 We will be talking about the genesis of my pieces Stilla Maris (drop of the sea) and California Water Rites, currently on exhibit with Waterlines. 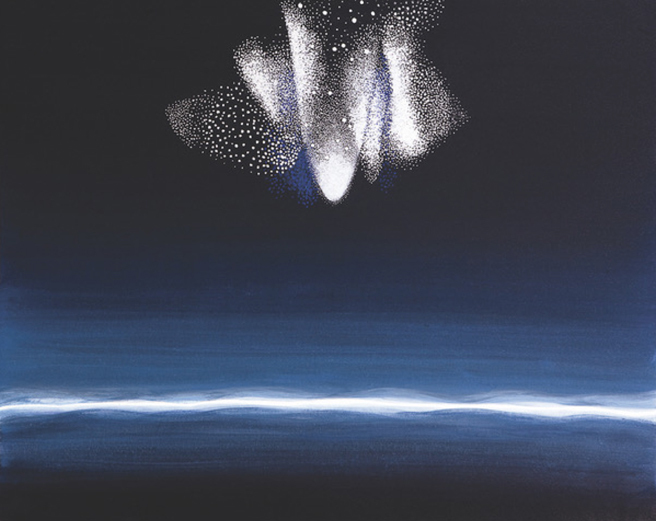 We will explore my artistic process, my relationship with water and notions of what might be considered sacred. 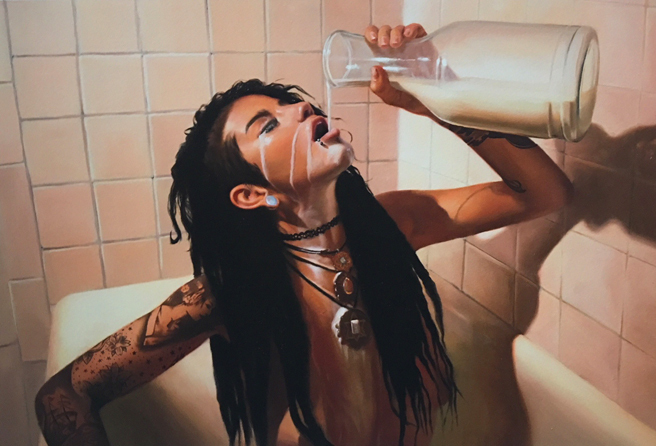 Come and ask me stuff! 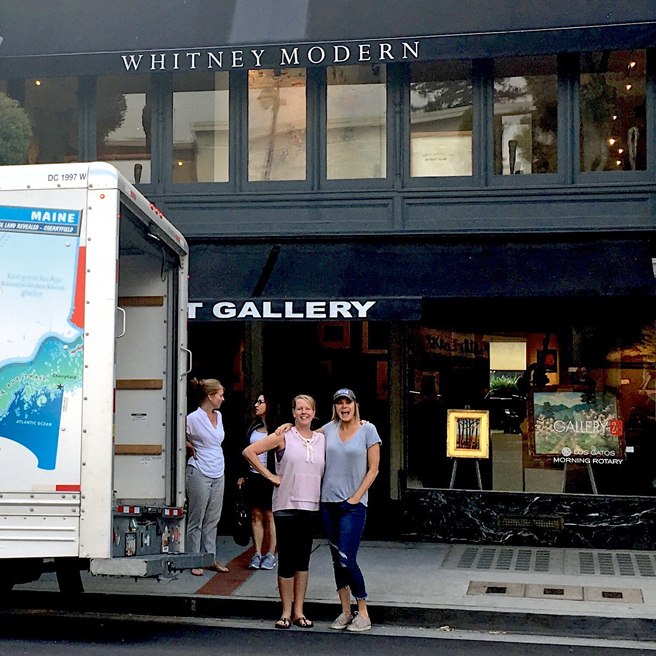 Share your experience of water and what it means to you! 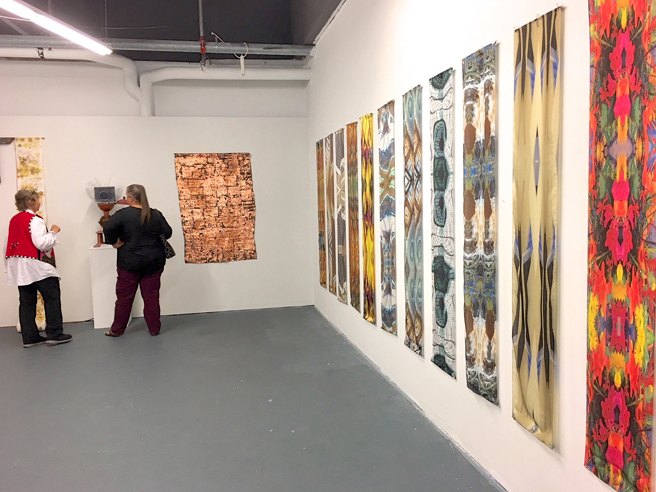 Here are some panoramic view of the exhibit which includes (painting, photography, assemblage, installation, video, drawing prints and sound pieces) by Judith Belzer, Barbara Boissevain, Marie Cameron, Matthew Chase-Daniel, Christel Dillbohner, Linda Gass, Nancy Genn, Liz Hickok, Theodora Varnay Jones, Pantea Karimi, Cheryl E. Leonard, Danae Mattes, Marsha McDonald, Klea McKenna, Ryan M. Reynolds and Linda Simmel, curated by Marianne McGrath. 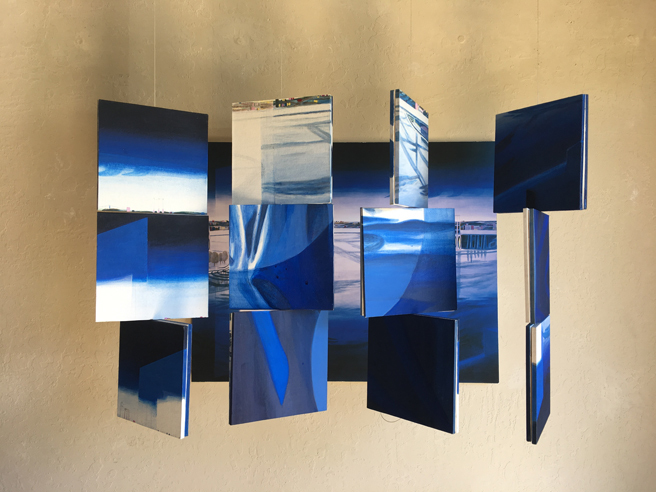 Several artists exhibiting with Waterlines will speaking about their work in conjunction with NUMU’s Winter Celebration which will run from 12- 4 pm. 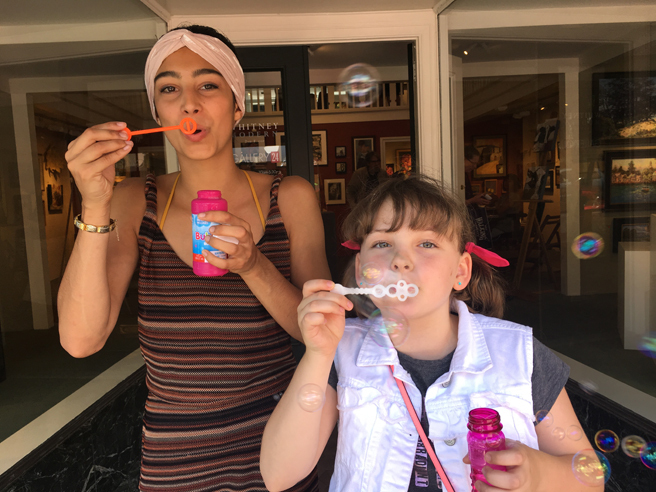 Check out this link for all the activities (including decorating sugar skulls)! 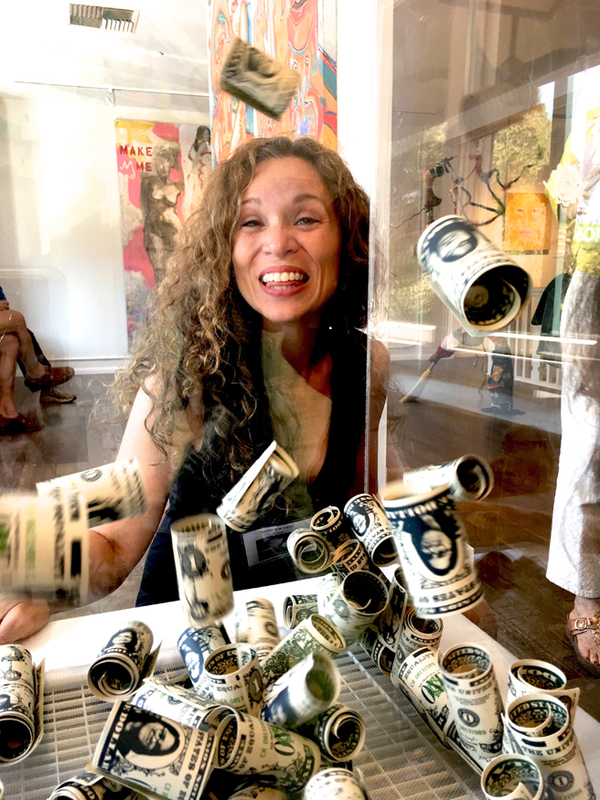 This is free for all NUMU members, $10 general admission, $6 for seniors, students and military and free for everyone 18 and under. 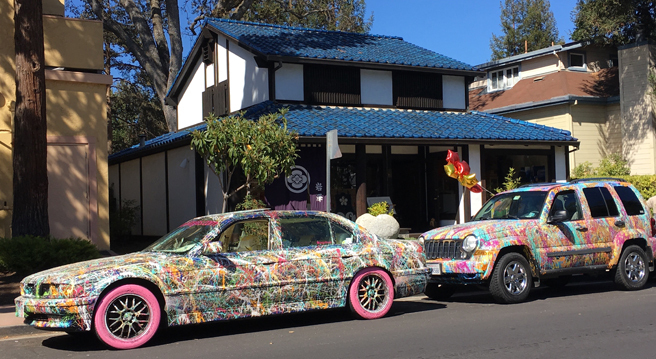 NUMU is at 106 E. Main Street in Los Gatos, California. 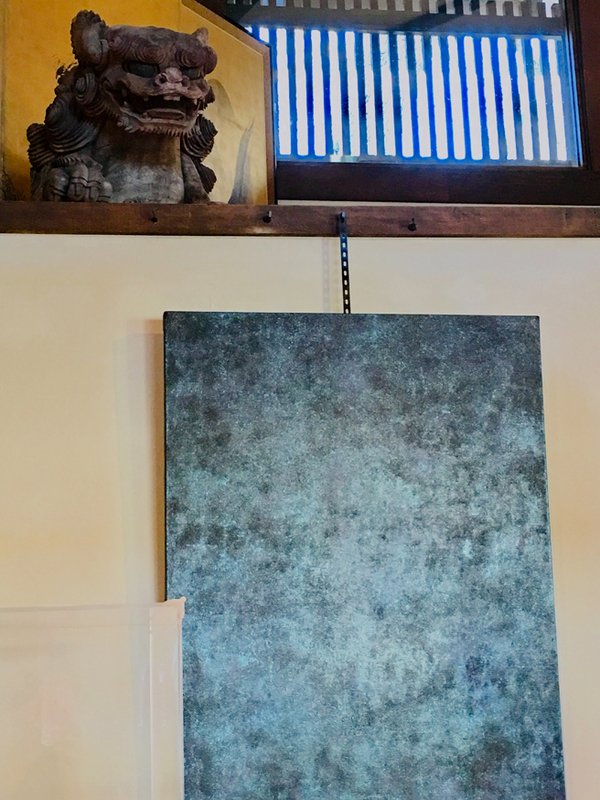 “If there are no dogs in Heaven, then when I die I want to go where the dogs went.” – Will Rogers. 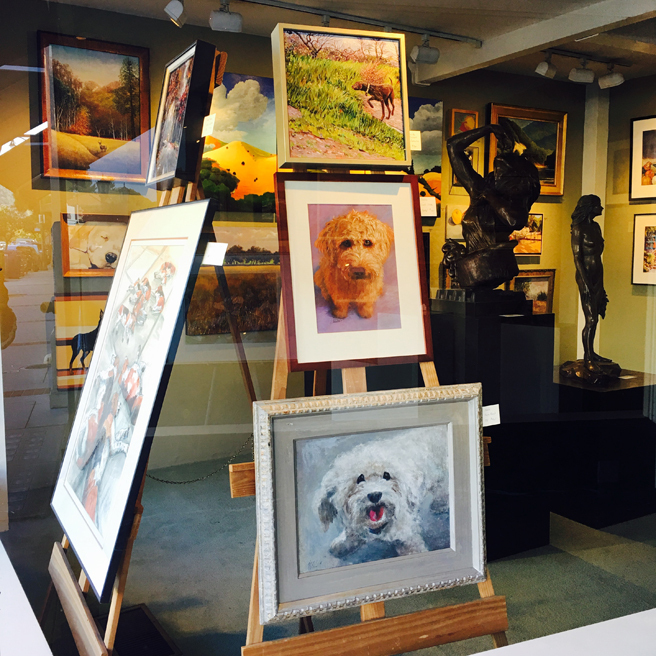 A pack of pooches were juried into the display in the front window of Gallery 24 for the month of November. 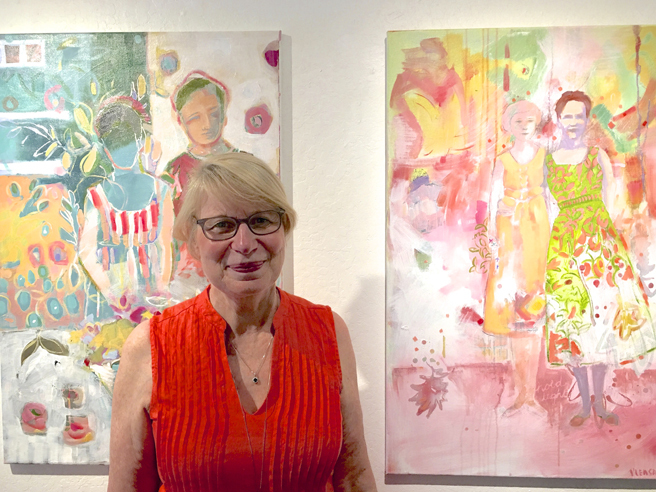 Paintings are by Julia Watson, Kay Duffy, myself, Sandi Okita and Kevin Kasik. 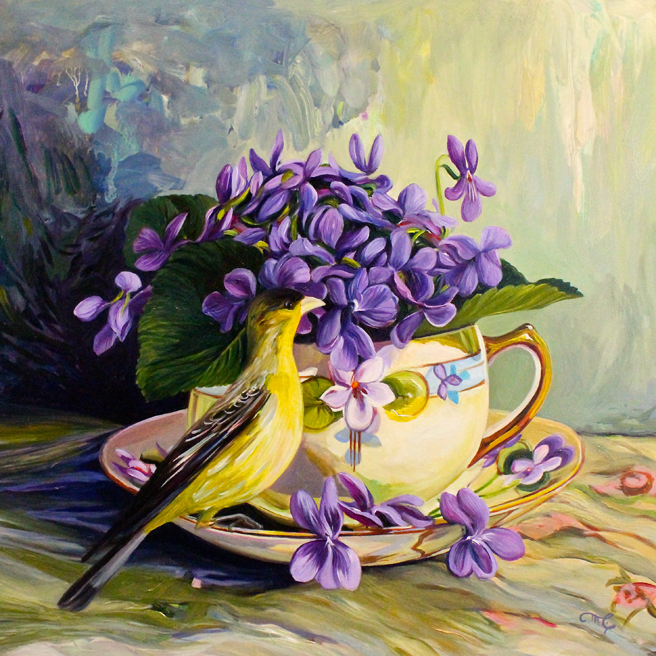 Here’s a close up of my painting, Retriever in the Orchard, a 12″ x 12” oil on panel. 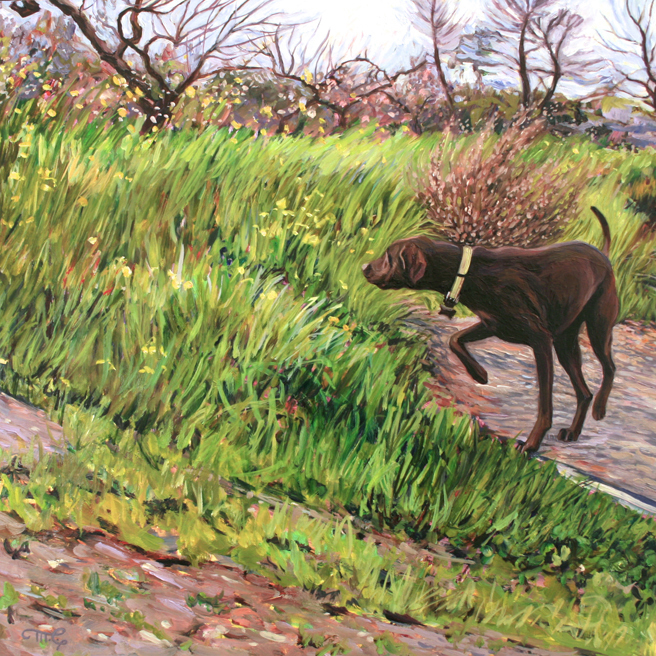 I met this beautiful chocolate lab bounding through the historic apricot orchard in Saratoga between rain showers and piano lessons one spring.